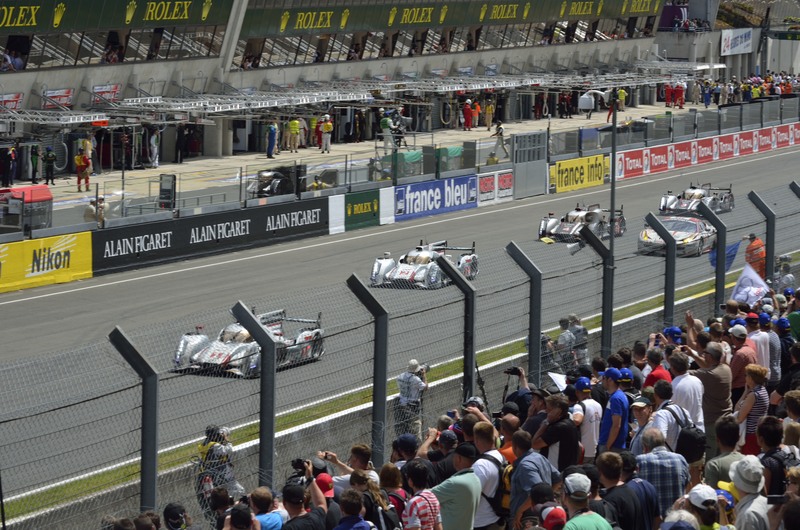 After spending Thursday on the TGV from Paris to Tours and taking in the old part of Tours, Friday was to be at the track for a special event. Ten-Tenths forum member extraordinaire James was able to work his magic again and line up a pit visit for a select few forum members. 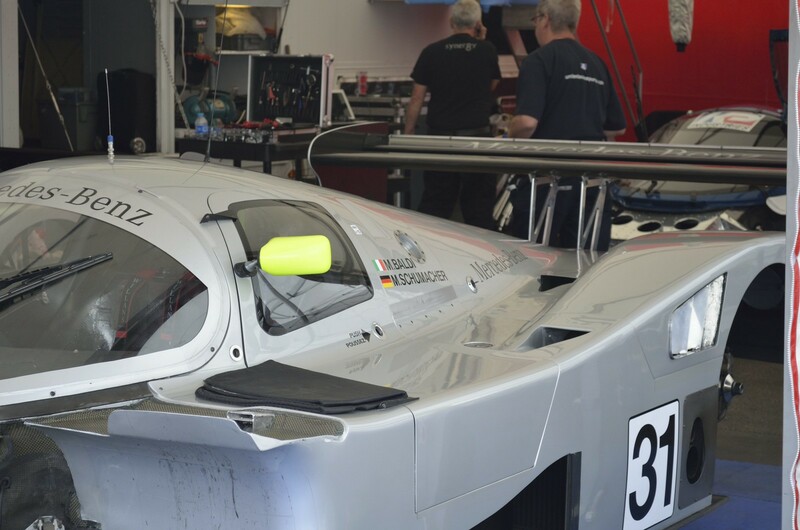 In 2010, when I became a regular on the Le Mans sub-forum, James was able to orchestrate a visit with the Rebellion LMP1 Team. 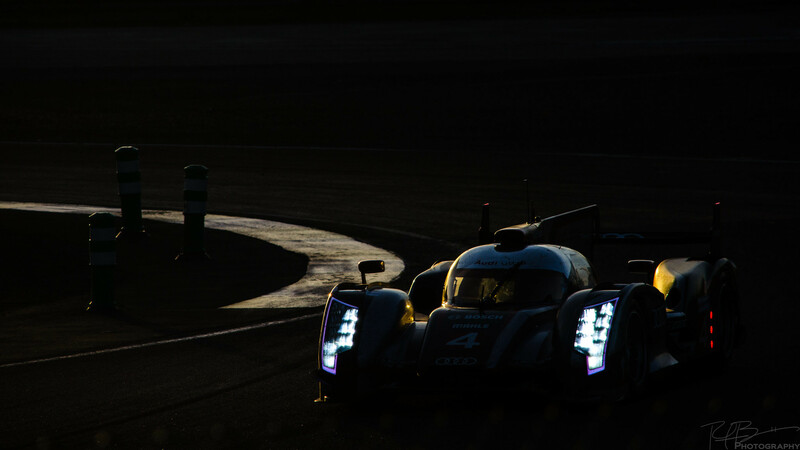 Last year, James had been in negotiations with a team and had everything lined up when, in the 11th hour, this team pulled out of Le Mans. Just a few days later, a representative with Audi reached out to James and they were able to visit the 2011 Le Mans winning Audi team and see their new R18. 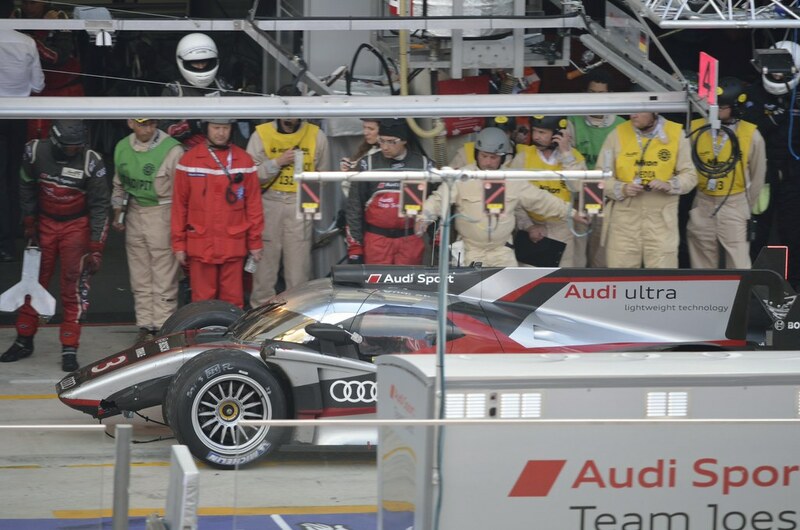 From all reports, the visit was incredible and Audi went above and beyond to accommodate the Tenths group. So much so, that Audi reached out to the Tenthers again this year and invited us to join them in their private suites above the pits to watch this year’s nighttime qualifying. This year, James was at it again. 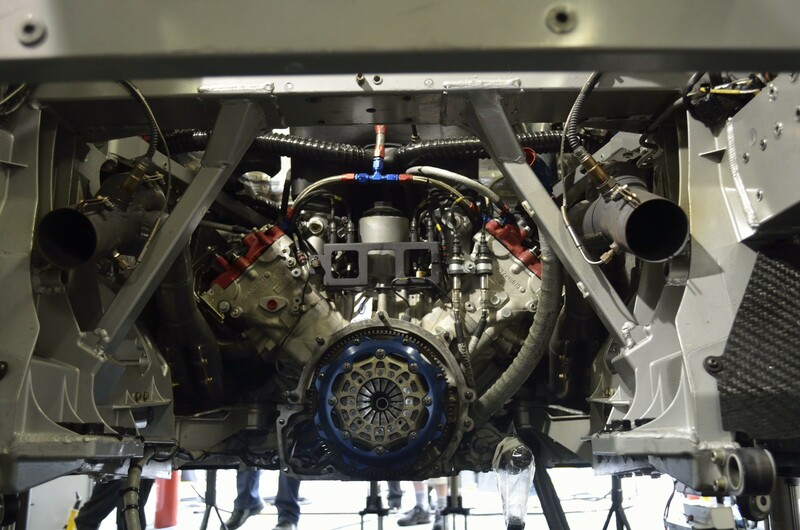 20 hand-picked members of the Ten-Tenths forum would get the opportunity to get an up close and personal tour of the new Toyota TS030. 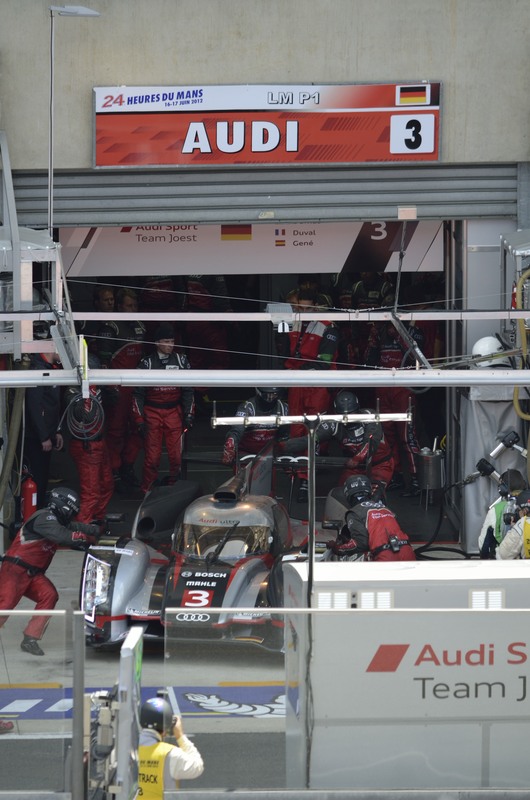 Audi last year and Toyota this year – James has far exceeded any and all expectations. 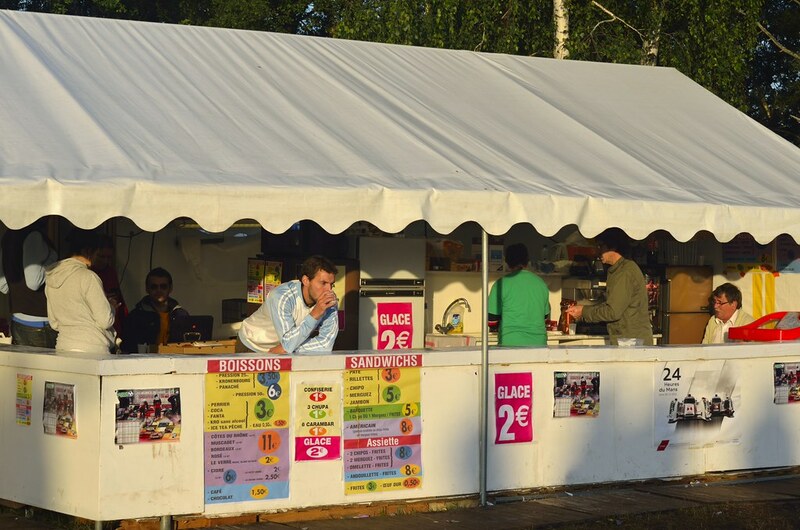 The tour is set up for Friday – the day before the race – and I’m in Tours. I have to get to the track, go on the tour, and get back to the station to catch my train back to Tours so I can get to the hotel and meet up with Trevor and the rest of the Grand Prix Tour group. It was both easier and more difficult than I expected. I get up Friday morning and check out of my little hotel next to the Tours train station. I take my bags down the street to the Hotel de L’Univers – I’ll check in when I get back. I head back to the Tours train station and wait for my 9:00 train bound for Caen with stops in between, including Le Mans. It’s another wonderful trip through the French countryside stopping at Chateau-du-Loir and Ecommoy before dropping me off right in the middle of Le Mans. Just outside the train station is a stop for the Le Mans local SETRAM light rail. 1.40 Euro gets me a ticket from the center of town down to the new Antares station next to the MMArena – just outside the circuit. My friend Walter – another great member of the Tenths forum – has offered to meet me at the gate and take me to pits for our Toyota visit. Walking up to the gate, I’m greeted by a parade of cars with similar graphics that leaves little to the imagination as to their origin. Just inside the gate, I see Walter waiting patiently for me. A quick handshake and pat on the back, we’re on our way. But not directly to the pits. Walter has a little surprise for me. The more I get to know my fellow Tenths members, the more I learn about them. Walter’s experience and knowledge of Le Mans is considerably greater than mine. 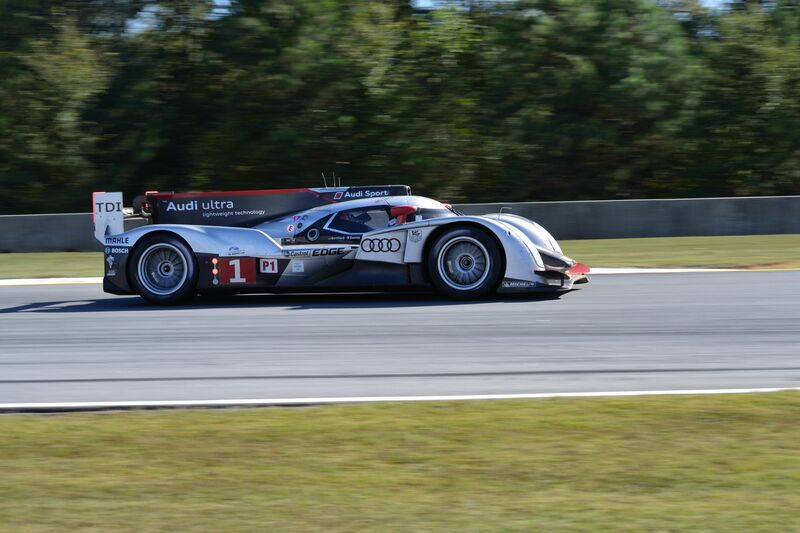 I saw my first American Le Mans race in 1999 or 2000 with the Audi R8. Sure, I know about the great battle between Ford and Ferrari in the late ’60s, but I have a gap from the ’70s, ’80s and ’90s. 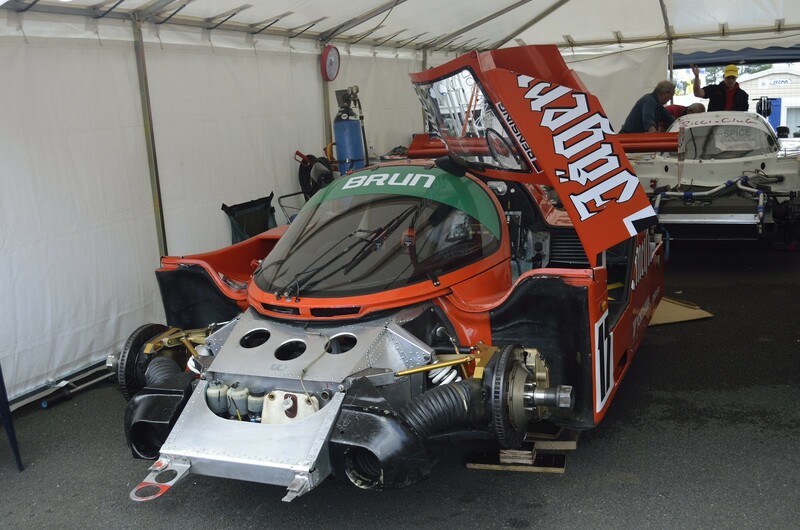 Before Audi, competitors at Le Mans in the ’80s and early ’90s raced in the class known as Group C. With bubble canopies and massive tails, these cars more resemble wingless aircraft than cars. 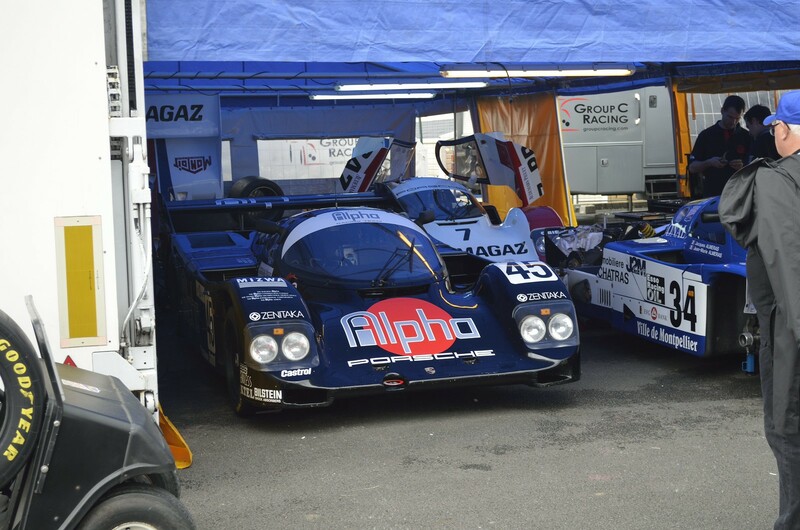 And Walter is a bit of a Group C groupie. Just before meeting me at the Antares entry, Walter and his friends Bryan and Ton were exploring the Group C paddock down in between the Village and the main paddock. Walking in, Walter has a few words of advice: All you have to do is ask. The answer is either “yes” or “no”. If you don’t ask, the answer is always “no”. Initially, I was a bit confused by this, but I went with it. Just past the security guard, I’m greeted by a pair of Mercedes legends. All around us are other legendary cars in various states of assembly. 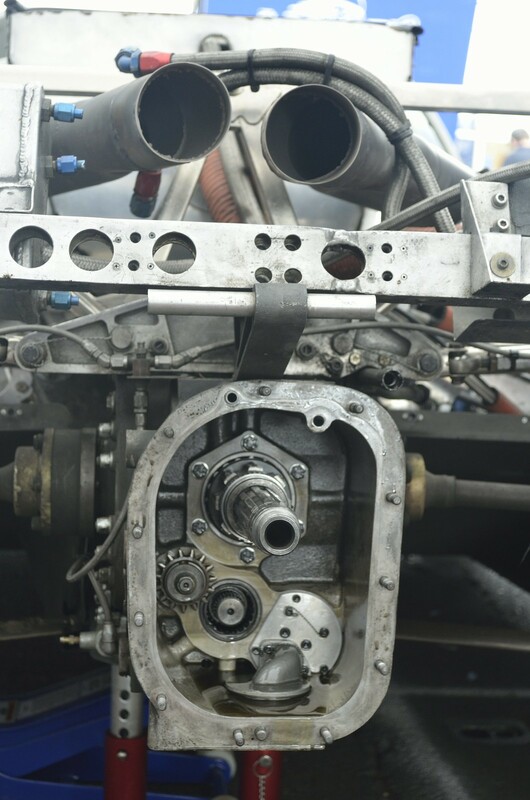 With noses and rear decks removed, mechanics are repairing or replacing various mechanical parts in preparation for tomorrow’s support race. 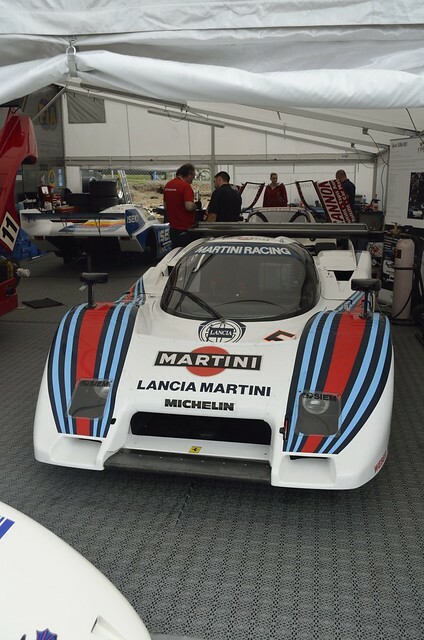 In the tent next to the Sauber Mercedes, is the gorgeous Martini-liveried 1984 Lancia LC2. Most of the cars are behind ropes and I’m getting pictures as best I can. Walter asks me if I’d like a closer look: “No, I don’t want to bother them. Besides, I don’t think they’ll let me in.” If you don’t ask, the answer is always no. “Excuse me, can we get a closer look so my friend from America can take some pictures”. Without hesitation, a mechanic looks up and invites us in. Walter looks at me and gives me a knowing wink. This one is great. This is the 1989 Spice SE89, and for about 5 minutes Walter and I watched this mechanic fiddle around the engine bay. He was working this multi-linked rod from the cockpit, around the newly rebuilt engine, and into a metal sleeve in the back. I ask what he’s working on. “Oh, this is the gear-shift control rod.” Sure, I guess that would be kind of important to shift gears. “No, not just shifting gears. When it gives, you are stuck in one gear.” Has that happened before? He looks up at me, smiles and says: “Not after I’ve installed it.” Just great stuff. 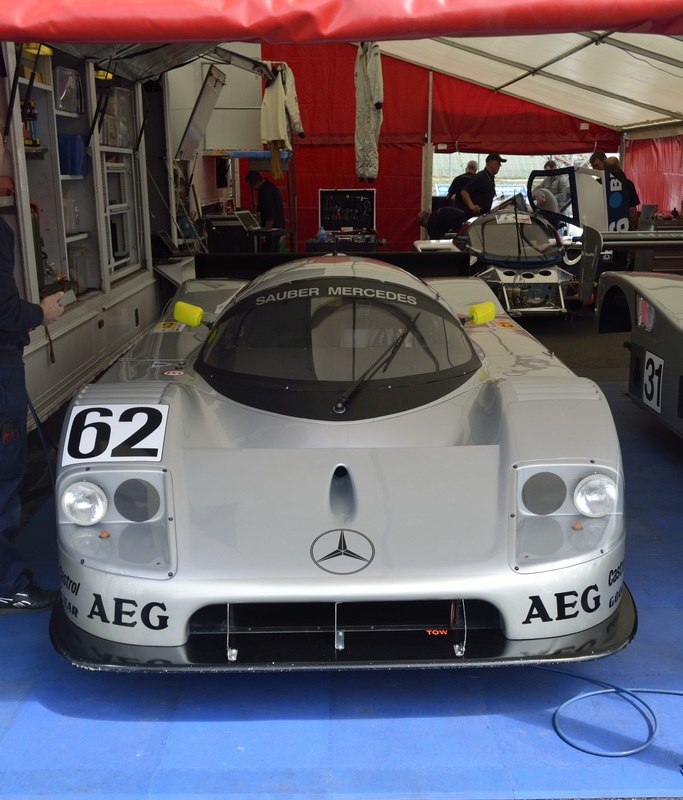 Scattered about the temporary paddock are more great examples of Group C racers. 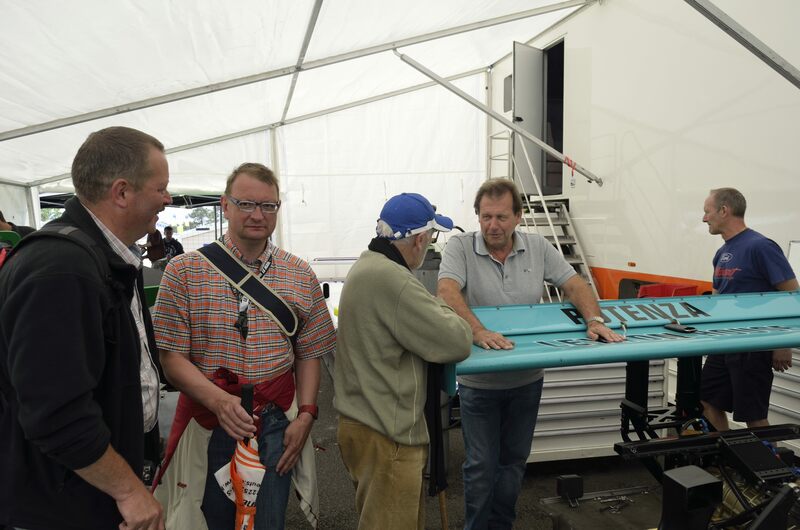 Walking about, we spot Group C and JMW Ferrari driver Roger Wills giving some friends of his a tour of the Lancia he’ll be driving in the warm up race tomorrow. 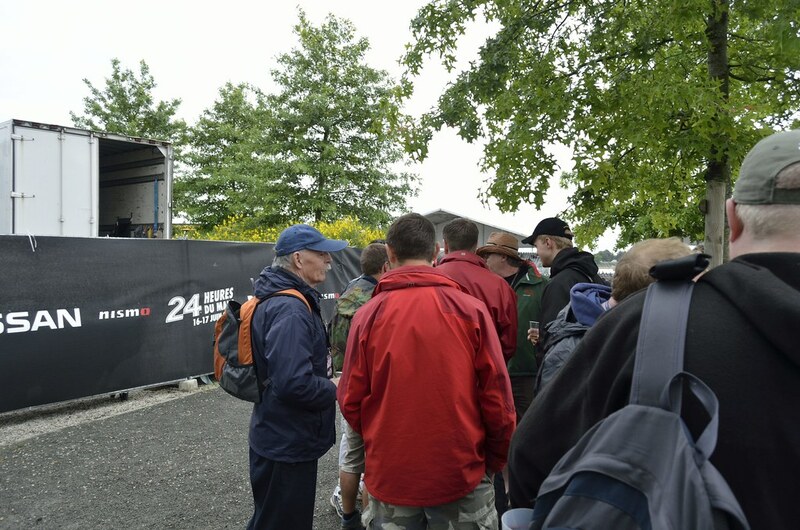 On the Tenths forum, in the weeks leading up to the race, we had been discussing our Toyota tour as well as our annual pre-race get together when we got an unexpected surprise invitation. It turns out that Roger Wills is a fellow Tenths member and he reached out to us. 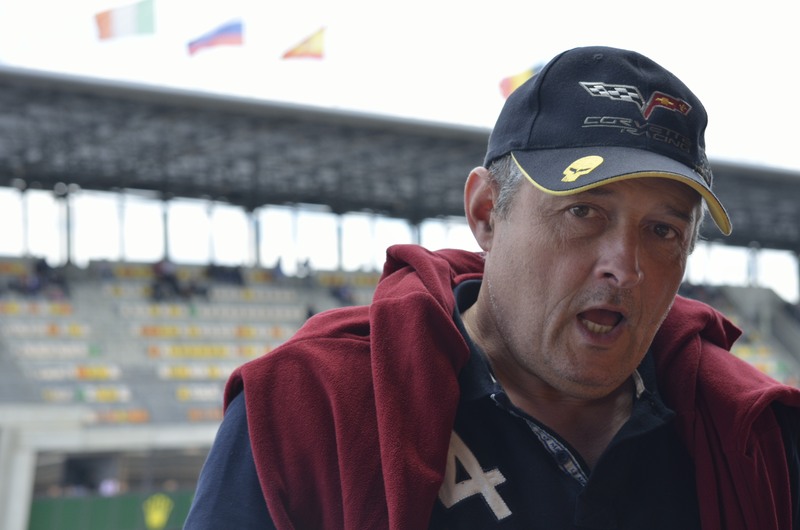 He said if we’re going to be down in the pits on Friday, why don’t we stop by his Ferrari team and he’ll show us around. Not only do we get a private tour with Toyota, but a Le Mans competitor has also directly invited us to visit his team. Unfortunately, some of these incredible machines wouldn’t survive tomorrow’s Group C support race. With that, Walter and I find his friends Ton and Bryan. We make our way into the Village for a quick bite to eat. It’s about 12:30 when we find a spot to sit down and relax before heading down to the pit lane. Over croque monsieur’s, sausage sandwiches, Coke and beer, the four of us chat about the race, getting here, and what it’s like where we live. It’s great to add two new friends into the mix. After some ok lunch and great conversation, the four of us make our way down towards the pits. From my experience last year at the track, it’s oddly quiet. But then again, it’s not race day. It’s about 1:30, we’re supposed to meet up with Roger around 2 and the Toyota team at 3. We find our Tenths meeting spot across from the Toyota pits. 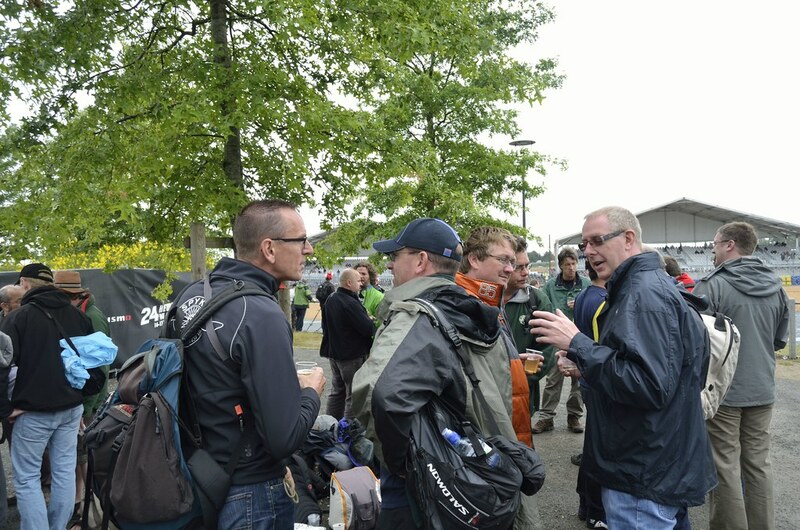 A few other Tenthers are starting to gather – Nobby, Bernard, Mathias, and Eric just to name a few. 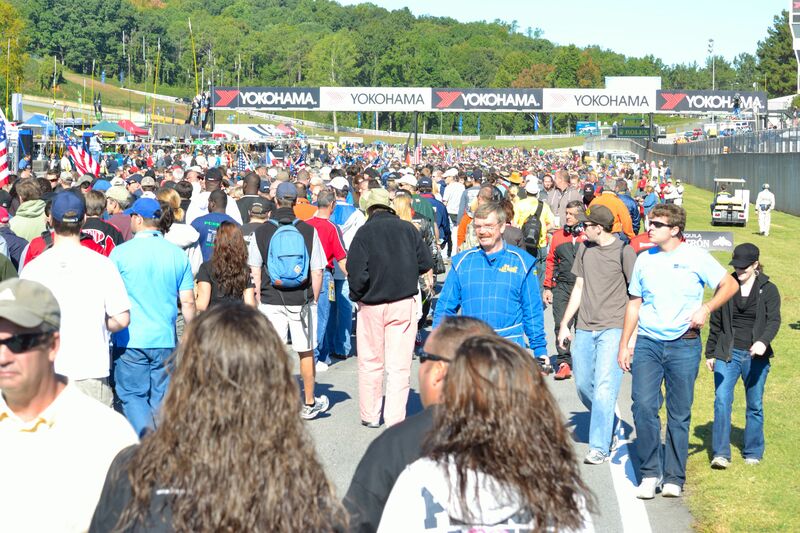 The pitlane is a sea of humanity. I know there are only a few thousand people here, but it’s packed in. Several of us make our way down to the JMW Motorsports pit and wait patiently. Moments later, out comes Roger scanning the crowd. 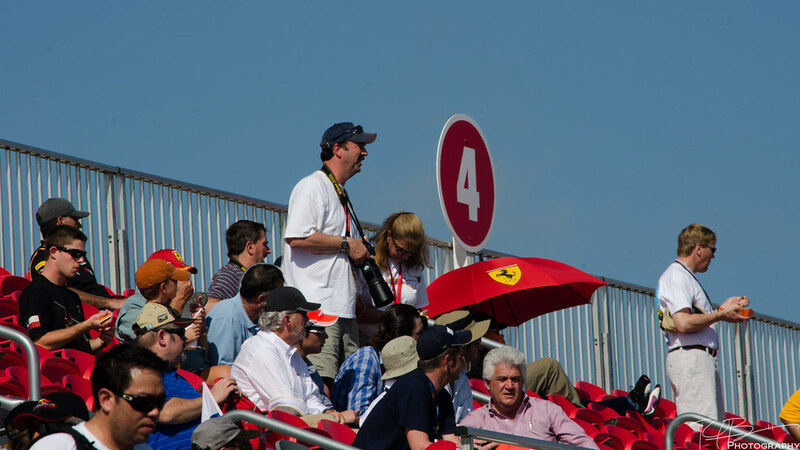 I raise my hand and he recognizes me from the Group C paddock – I’m sure the Razorback hat made it a little easy. He waves me and the rest of the Tenths group in, welcomes us and he starts telling us about the car. 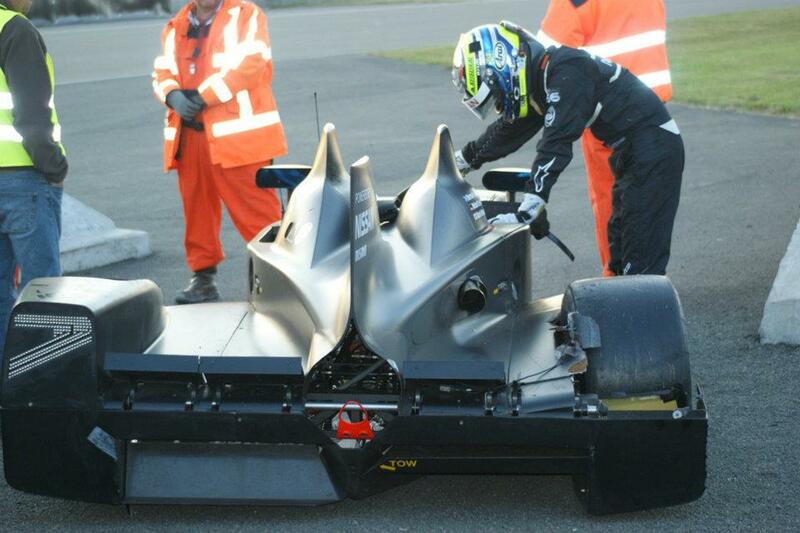 Its last year’s car, but updated with the flappy-paddle gearbox. It has a rear-view camera mounted in the bumper with a small screen in the cockpit showing him what’s behind him. They’ve broken the car down to its basic components to check and double-check everything so that when its put back together, it’s in tip-top form for tomorrow’s race. The car is disassembled and there’s a long list of things to do to get the car ready for tomorrow. 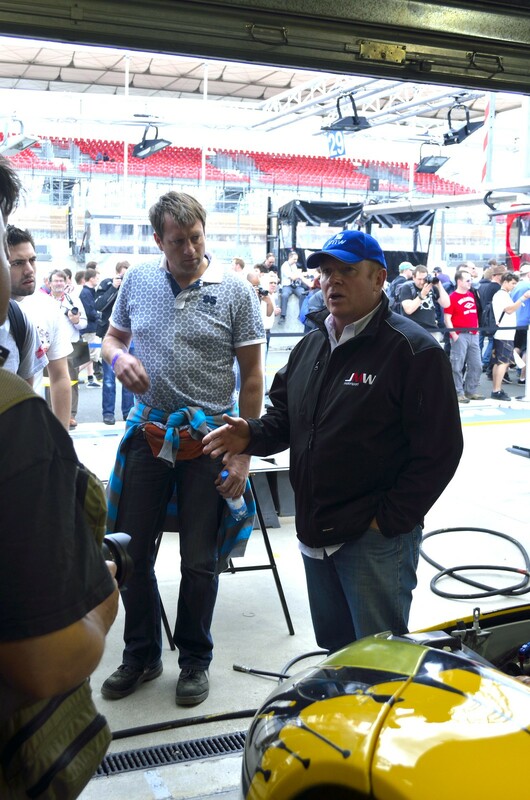 Roger tells us about his team, and just at that moment, his fellow co-drivers – Jonathan Cocker and James Walker – come walking by. I shake their hands and wish them good luck. Roger continues explaining a stint is about 2 hours for each driver. 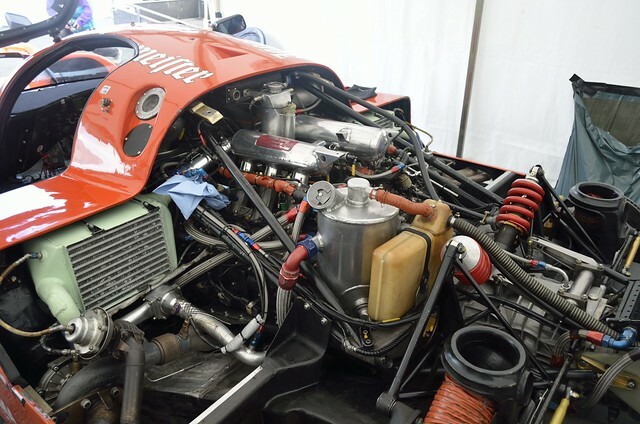 Long enough for the driver to get out of the car, visit the team doctor, get a bite to eat and something to drink, and maybe some rest, before hopping back in the car and going back out on the track. Roger’s now moved us towards the back of the garage, where we meet his data engineer, Oli Harding. Oli goes onto tell us about their telemetry program and how it all works. 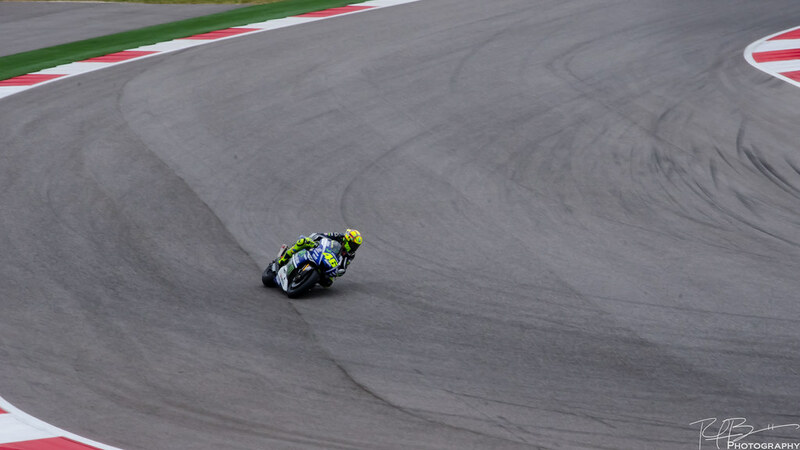 Roger recalls how he was driving during practice when Oli told him to take his foot off the clutch. 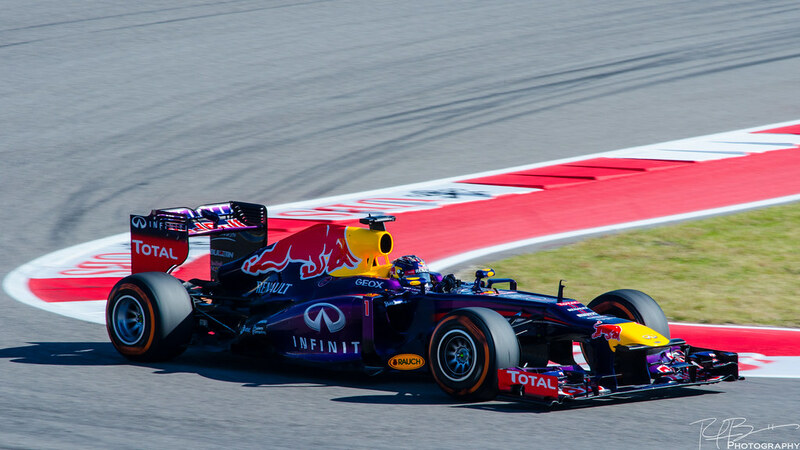 Inadvertently, Roger was resting his foot on the clutch pedal and that was giving just enough feedback – 3 to 4% pressure – that the team noticed it. 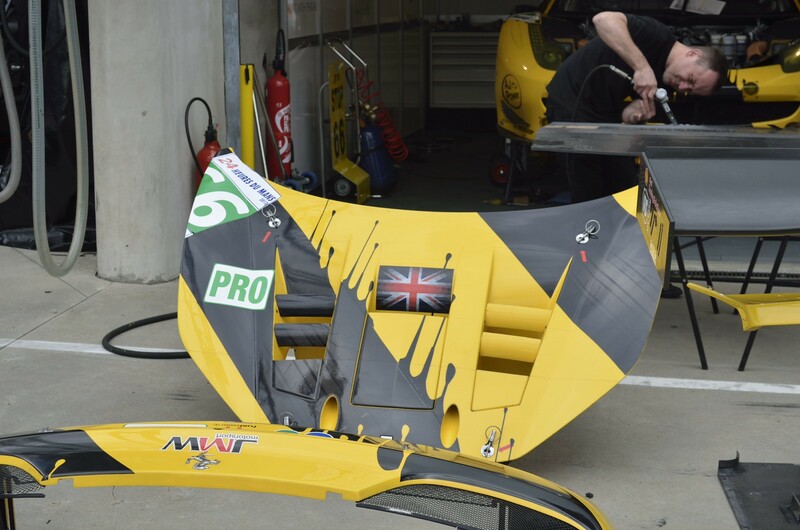 I ask if it’s MoteC – a program I’m familiar with from sim-racing – and Oli tells us it’s not; they use a similar program from Bosch Motorsport called WinDarab. Additionally, race tracks are typically broken down into 3 sectors, but because of Le Mans’ length, they have it broken down into 8 sectors. Roger tells us their system is so good they can tell him he needs to break later or earlier, be softer or harder on the steering input, and when to jump on the throttle. 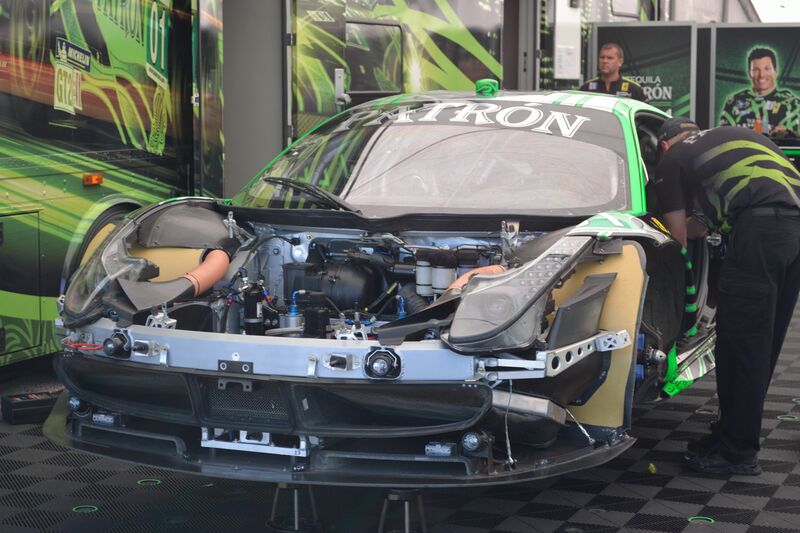 Without a doubt, this is the most fascinating and inside look into a racing team I’ve ever experienced. Our time is up and we bid the team good luck and best wishes for the race. Just outside, a group of Dutch fans are heckling/taunting/singing to all the teams. We make our way back towards the Toyota pits where I finally catch up with James, Andrew, and Tony – my Tenths friends I’ll be sitting with tomorrow. With smiles on everyone’s faces, I’m seeing friends I haven’t seen in a year – and it’s a great feeling. More Tenthers are arriving: Simon, Christopher, Pascal as well as a few faces whose names I don’t know yet. But thanks to the common bond that is the Tenths website, we’re all smiles and anxiously awaiting our Toyota visit. Shortly after 3:00, James gathers us together and a gentleman in Toyota gear asks us to follow him. He and James have a quick conversation before breaking the us up into two 10-man groups. I’m in the first group and we’re led through security. 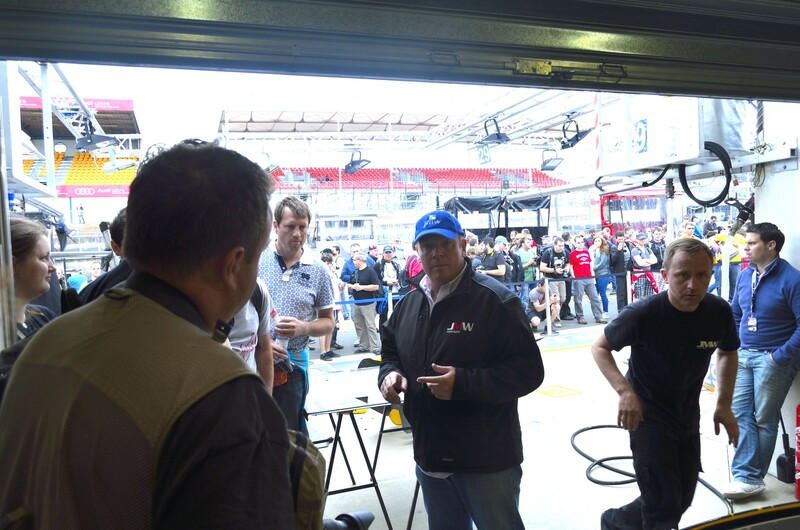 Behind the pits, the gentleman in the Toyota gear introduces himself: Alastair Moffitt with Toyota Europe. Alastair gives us a quick run rundown of the rules: stay together, ask anything you want, and unfortunately – no photos. There will be a secure place for us to put our packs and cameras. Before we head in, a few things catch my eye. 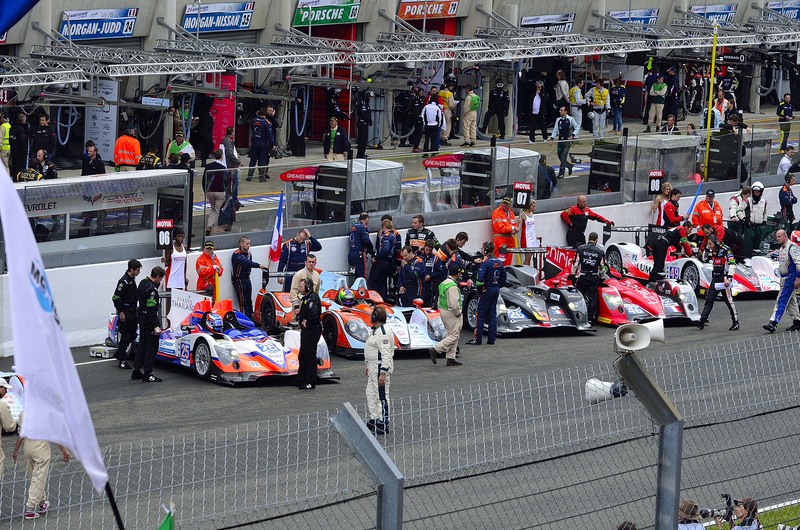 This is just common sight at Le Mans. 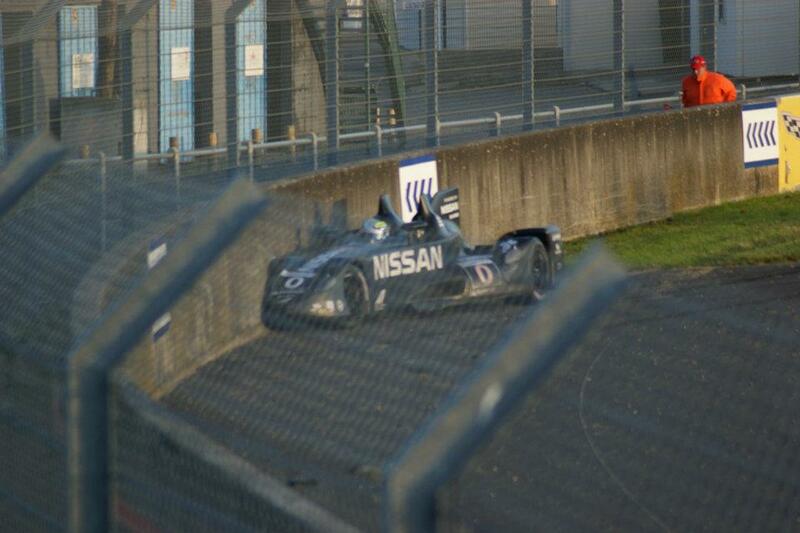 Moments later, up walks Toyota driver Alexander Wurz. 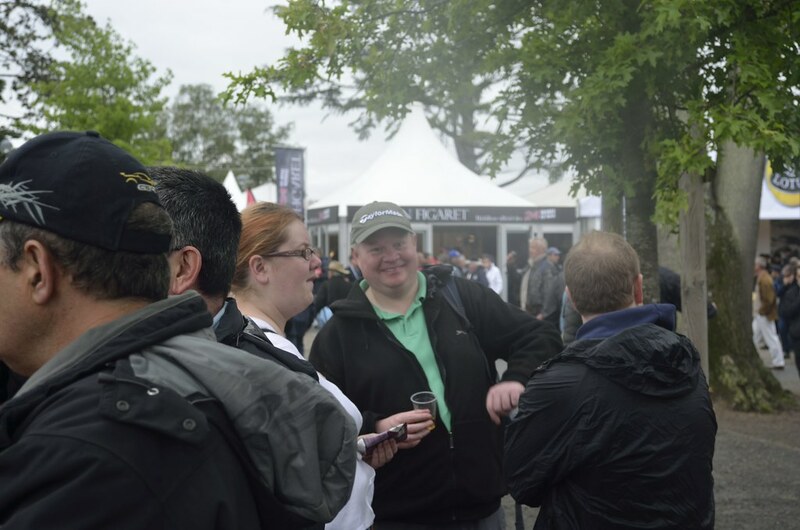 From my brief encounters with Johnny Herbert and Allan McNish last year, both of those gentlemen were slightly shorter and considerably smaller than I am. It makes sense, the smaller the driver, the smaller and more aerodynamic you can make the cockpit. 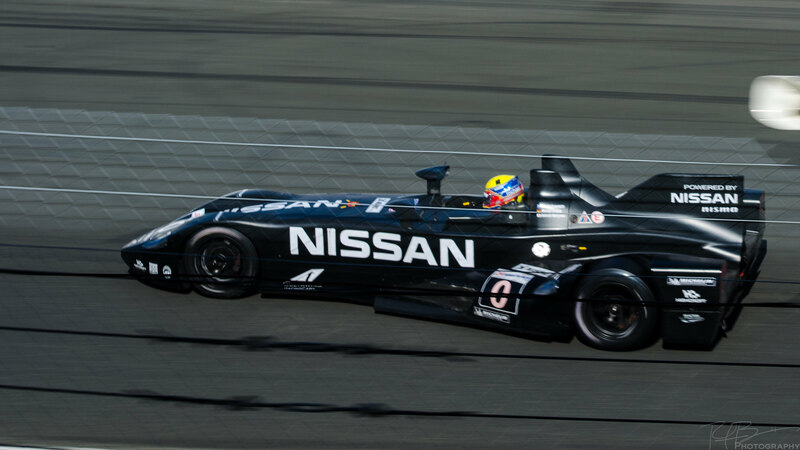 But Alex Wurz is HUGE. 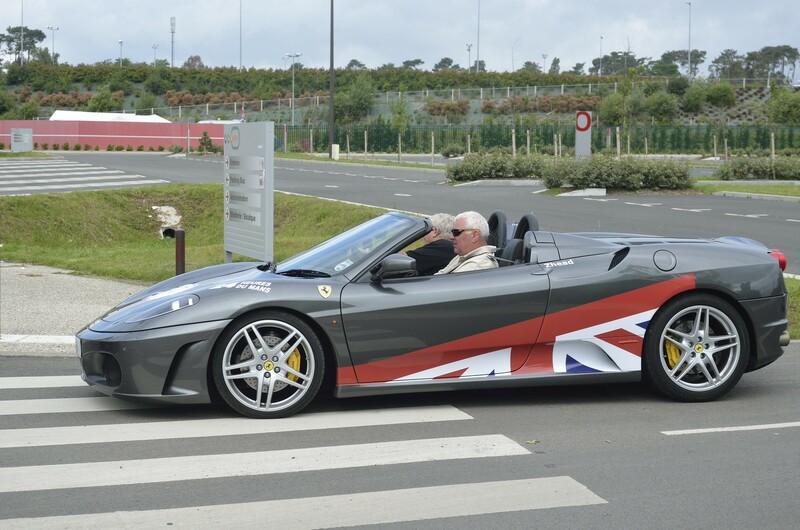 I can only imagine him squeezing into the Toyota, last few Peugeot 908’s, and all those little F1 cars he drove. 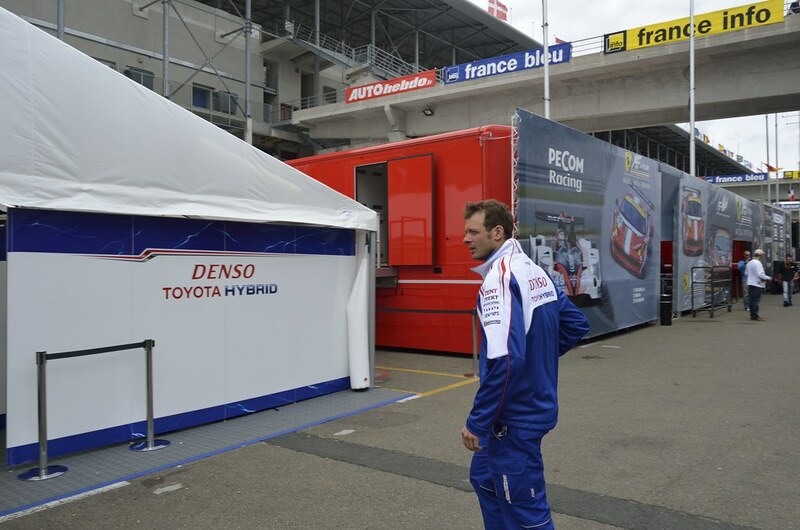 With that, Alastair ushers us into the Denso Toyota Hybrid tent and pit paddock. Inside, it is the definition of controlled chaos. That’s not a knock, it’s just a little overwhelming to me. Here’s a stack of tires, there are replacement tail pieces, here are replacement noses, and carbon fiber components scattered about. It’s abuzz with activity as mechanics and engineers are moving all over the place. In front, Alastair is talking and moving towards the front of the pit, Eric and I are the stragglers. I’m taking a closer look at the tail and nose pieces and Eric is talking with two of the engineers. 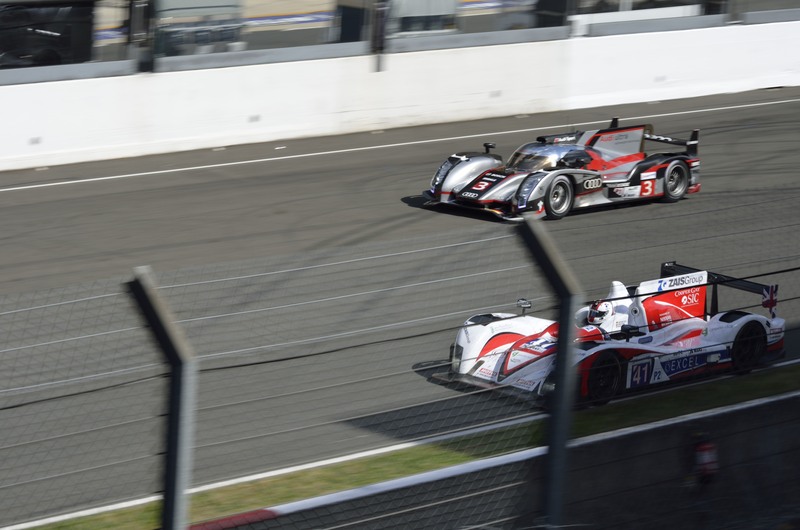 In a corporate collaboration, Toyota has partnered with experienced Le Mans competitor and constructor, Oreca, for logistical help. 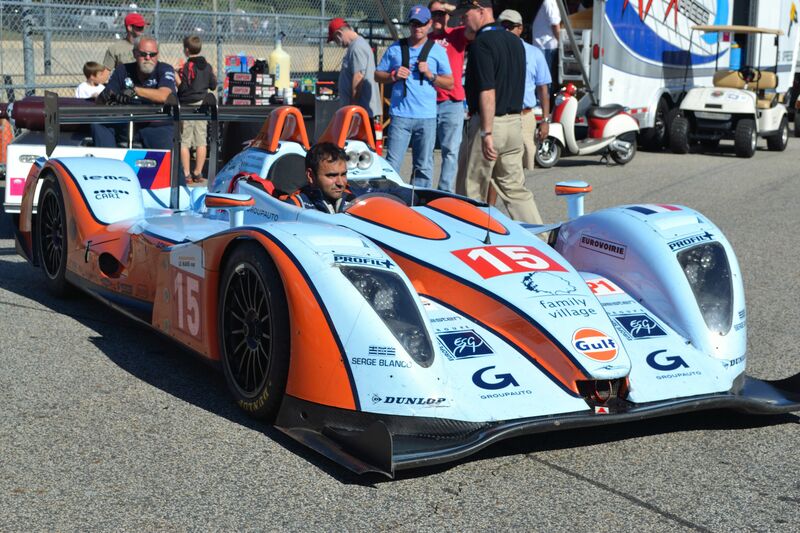 Oreca is based in France and, as I understand it, many of the mechanics live in or near Le Mans. Well, as it turns out, Eric also lives in Le Mans. He’s stuck up a conversation with a few of the mechanics and I’m lost in the back of the garage looking at all the parts of the car. Suddenly, out of the blue, a Toyota engineer/mechanic/top-of-the-food-chain guy comes up to me and Eric and asks if we’re with the tour. Yes. Well, why don’t you two get back on tour. With that, Eric and I move quickly to the front of the garage where two dismantled TS030’s are right in front of us – and it’s a bit surprising. All I see is the floorboard, the cockpit, and the engine. 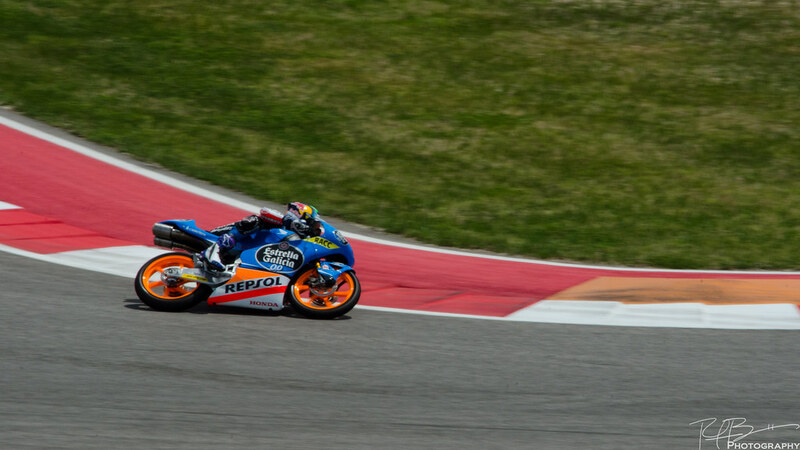 I know the engineers want to keep everything as low as possible for the lowest center of gravity possible, but what in front of me is surprising. A 3.4 liter V8 that can produce 500+ HP, literally sitting on the floorboard that then sits an inch or so above the ground. It’s a marvel of engineering. Catching up with the group, Alastair is talking about the hybrid system they use and how it’s different from the “other guys”. The “other guys” are Audi. Their hybrid system powers the front wheels, the Toyota system powers the rear wheels. And Toyota built theirs in-house. “They bought their system” Alastair says with a respectful/playful shot at Audi. After a few more questions and answers that are hard to make out due to the loud public address speaker, we make our way towards the back of the garage where we gather our packs. We’re taken outside to the Michelin tire engineers who are hand inspecting each of the tires. We chat with the tire guys a bit before our tour is over. We get back to the pit lane where Alastair and James corral the second group and the rest of us talk about what we’ve just seen. Initially, we were told each group would have 15-20 minutes with Toyota. Looking at my watch we’ve been with Alastair for almost 45 minutes! And now a small problem has presented itself. But so too have solutions. When we were first told about our visit, James told me I would have a spot in one of the two groups. I planned accordingly. 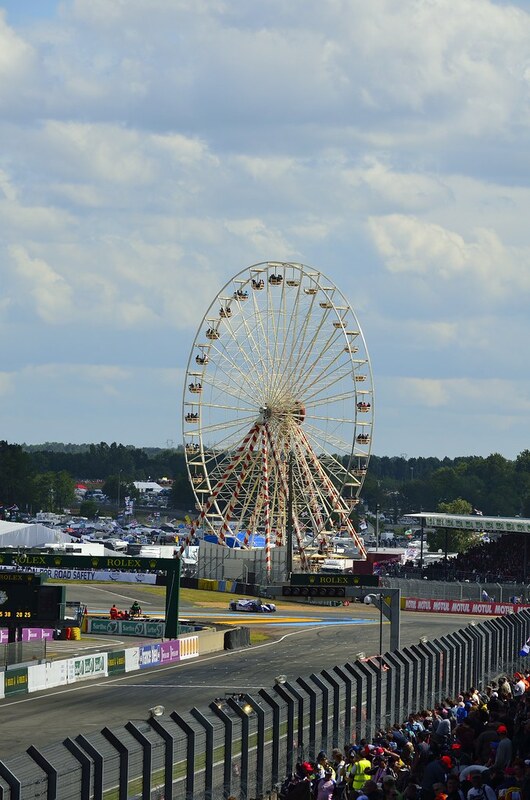 Staying in Tours, I would take a regional train to Le Mans, catch the SETRAM to the track, and just reverse course to get back to Tours to catch up with Trevor and the rest of the Grand Prix Tour group for dinner. With the train schedule finally set – the SNCF doesn’t release the train schedule until a few weeks before traveling – I purchased my tickets. 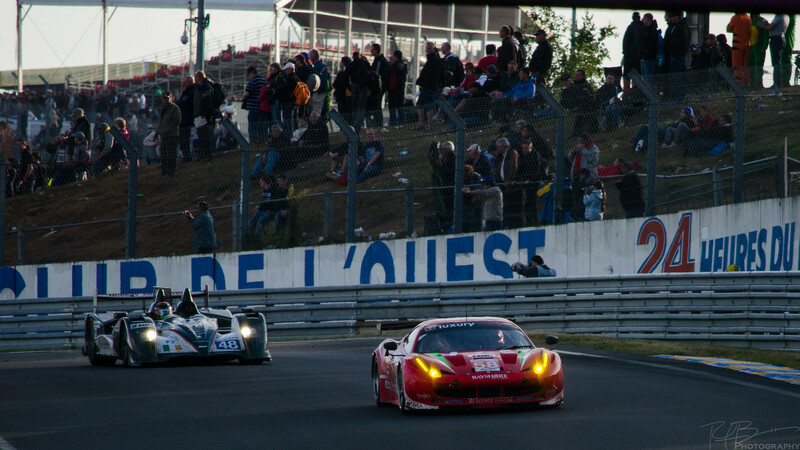 Leave Tours at 9:30 and get to Le Mans at 11. 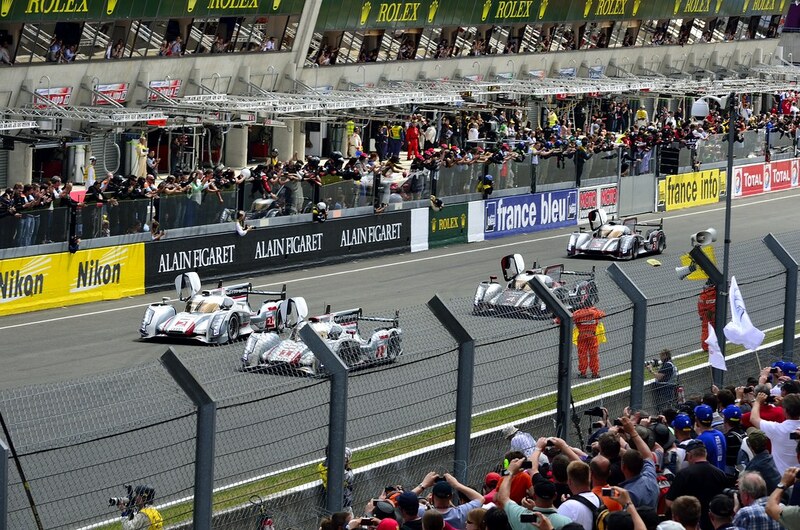 Leave Le Mans at 4:30 and return to Tours by 6. Absolute perfect timing. However, Toyota had other plans. Our pit visit wasn’t planned until 3:00. Dramatically narrowing my travel window. There was another train bound for Tours, but that wasn’t leaving until 6 or so, and I would miss or be late for dinner with Trevor. And, quite frankly, I didn’t want to miss dinner. So, in the Toyota visit discussion thread on the Tenths forum, I threw out my problem. But the guys online were more than willing to help. First to speak up was Christopher. He gave me some assurances, that with good timing, I could make my train and in the grand scheme of things, it’ll all work out. 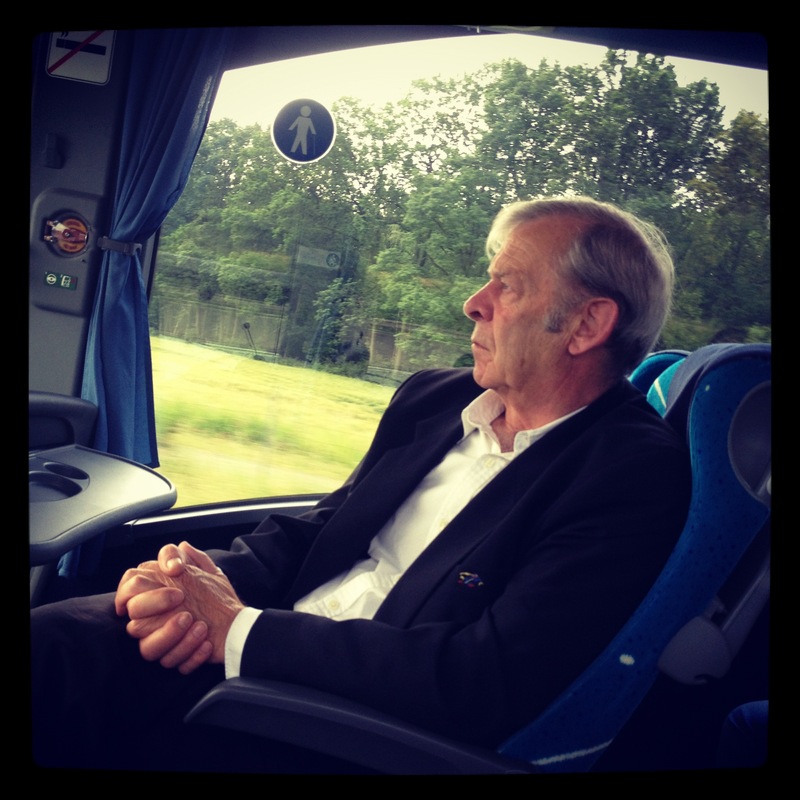 Next up was Eric – our Le Mans local. He said if the weather was good, he would take his motorcycle to the track and he’d get me back to the station in no time. Finally, Pascal speaks up and offers me a ride in his Peugeot. He doesn’t live far from Tours and he would take me back to my hotel if need be. The first group is out in the pit lane and we’re all talking about what we’ve just seen. Eric and Pascal check on me and my schedule. Looking at my watch, there’s no way I’ll make it to the SETRAM and then onto Gare Le Mans. 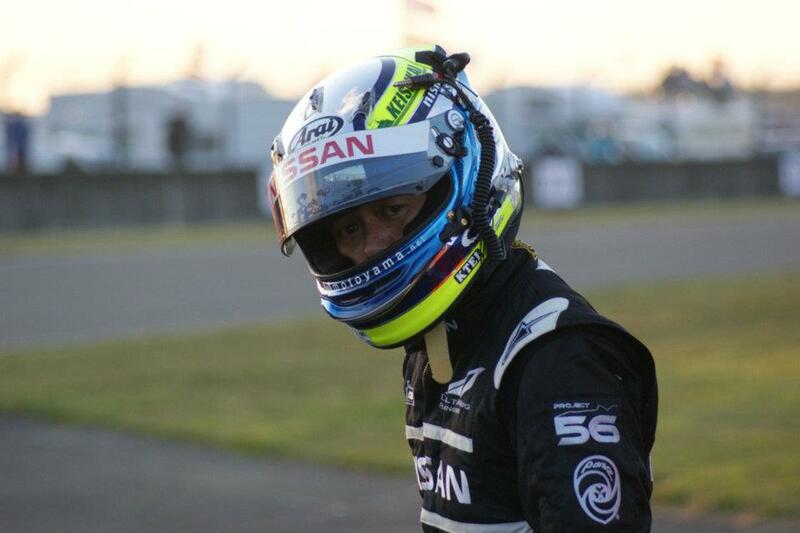 Pascal says tells me to come on and we head to the parking lot just outside the track. 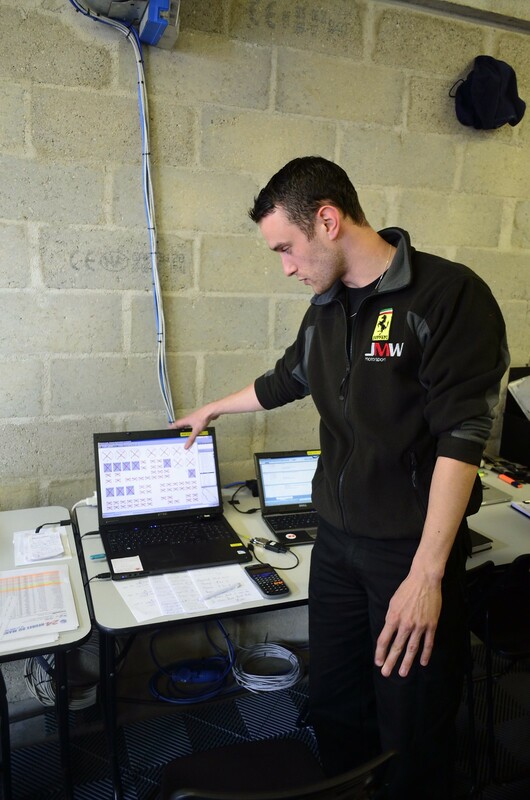 We get to his car and he pulls out his trusty TomTom GPS and plugs in the address to the Gare Le Mans. 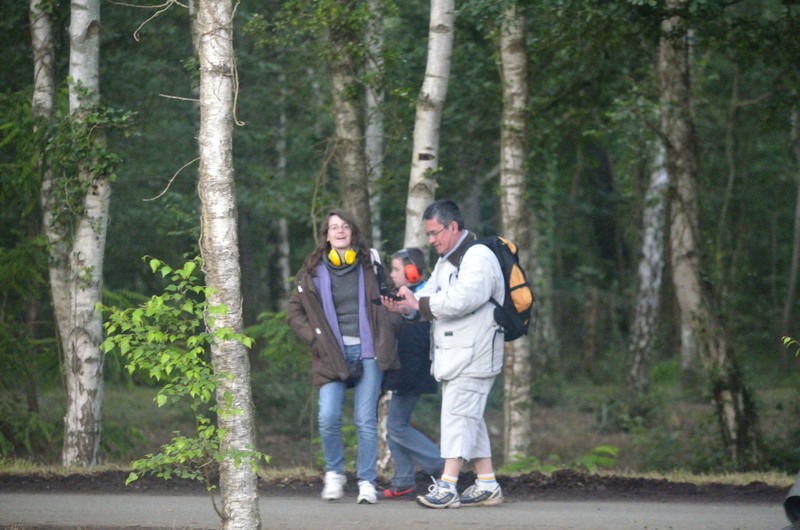 The funny thing is, as we get going, the TomTom is issuing directions in French. Of course it would, but it gave me a giggle nonetheless. One small problem, it keeps telling us to turn left onto one way streets. 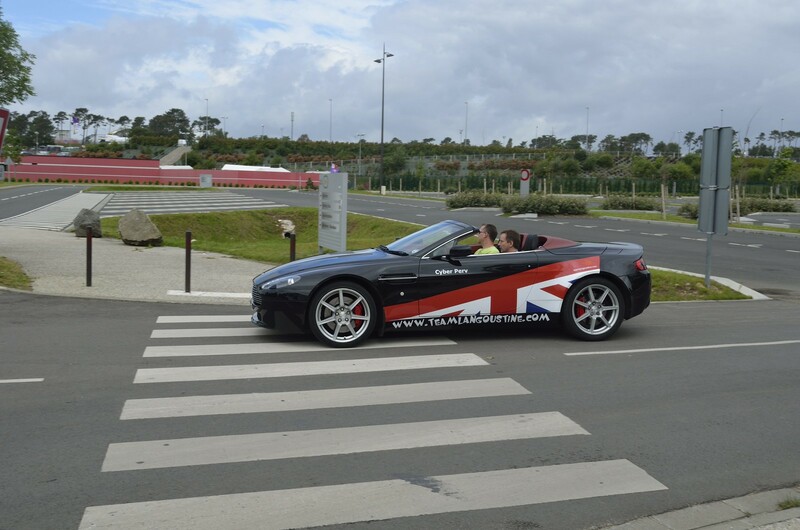 We make our way through town as best we can – his knowledge of Le Mans is a little rusty and mine is near zero. We spend the time talking about ourselves – what we do in the real world outside of the Tenths forum. He’s in information management and, while living in Blois, he spends his work week in Pairs. Blois and Tours share the Loire River and he lives about an hour from where I’m staying. Turn here, the TomTom says, but we can’t – it’s one way. Turn here – nope can’t do that either. Finally, we make our way onto Boulevard des Riffaudires that’ll take us to Boulevard Demorieux and straight to the station. Checking my watch, we’re cutting it close. 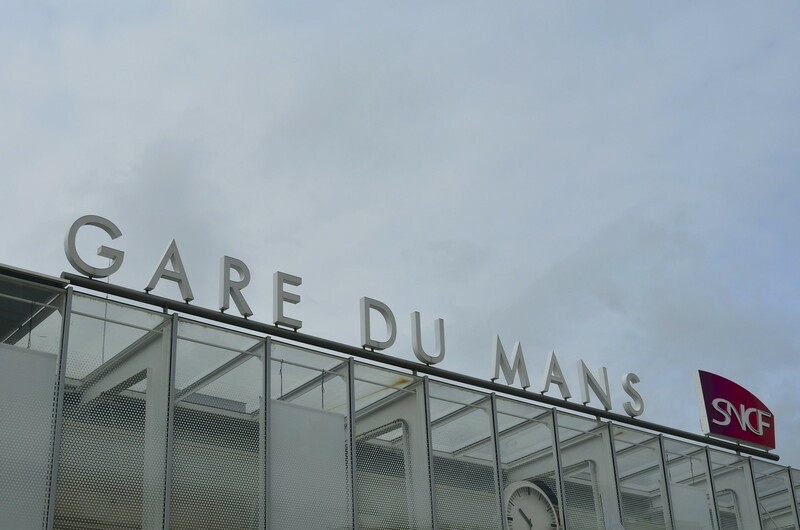 Finally, we make it to the station and with a quick handshake and a poorly spoken “merci beaucoup”, I hop out of the car and sprint into the Gare Le Mans lobby. I find a ticket kiosk, key in my reservation code and last name, and grab my ticket. Checking the train information board, I’m departing from platform 6. Another quick sprint and I find my train, hop on board, and grab a seat. Two minutes – and I’m not exaggerating – two minutes later and the train is pulling out of the station. Talk about by the hair of my chinny-chin-chin, that was close. Not that it would have been a bad journey to Tours with Pascal, I honestly didn’t want to put him through the trouble. With that, I’m again rolling through the French countryside. I don’t know how to describe it, but there’s something magical about riding the train through Europe. This is something I will definitely do again. I’m back in Tours in no time where I check in and grab my bags at the Hotel de L’Univers. Up to my newly remodeled room where I take a much needed shower and shave. It’s almost time for dinner, but more importantly, time for a drink in the hotel bar. Exiting the lift, walking right in front of me is Trevor from Grand Prix Tours. 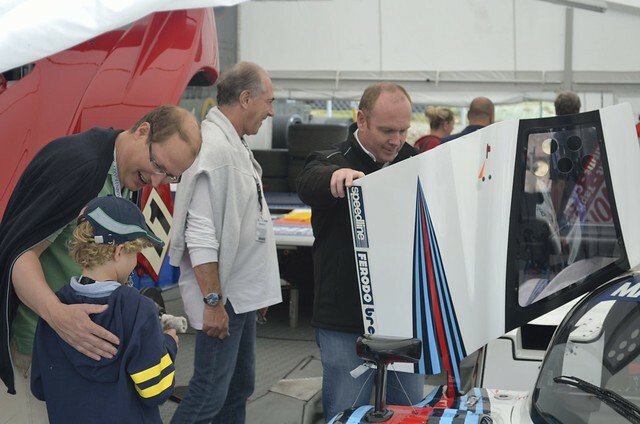 Last year, Trevor and I hit it off and he was one of the selling points in using Grand Prix Tours again this year. He’s a wonderful English gentleman with a racing background and he knows his stuff. In the months after returning from last year’s trip, I was able to find Trevor on Facebook where we would chat online from time to time. Calling out to Trevor, he turns around with a smile and it’s like catching up with another old friend. Trevor and I make our way to the bar where we get a drink and he gives me a Le Mans history book that was a Sunday newspaper insert a few weeks ago. It’s a wonderful gesture and a prize I have and will read often. Finishing our drinks, we move into the main dining room where the rest of our GPT group is waiting. 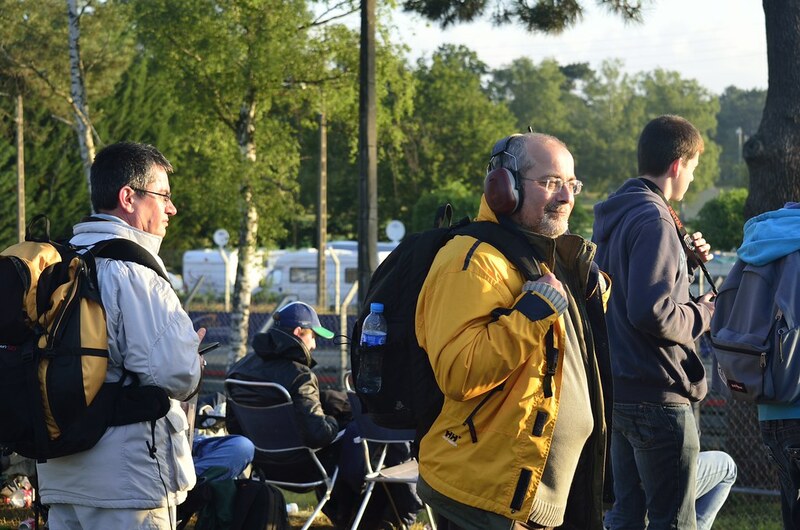 At our dinner table are two couples who have visited Le Mans before as well as first-timer, Gary. Gary lives in Detroit and is an engineer of some sort with General Motors. Over dinner, he and Trevor discuss certain automotive technicalities like the spring and roll bars of various racing cars. I knew some of the things they were talking about, others, not so much. Afterwards, Gary strikes up a conversation with me and Trevor about what he wants to do and where he wants to go. Some places: yes. Others: no. I offer my experiences from last year – he takes some with a grain of salt, others he clings to. Trevor turns in while Gary and I head to the bar to discuss more of what to see and where to go. After a drink, it’s getting late so we call it a night – Gary, you still owe me a beer. 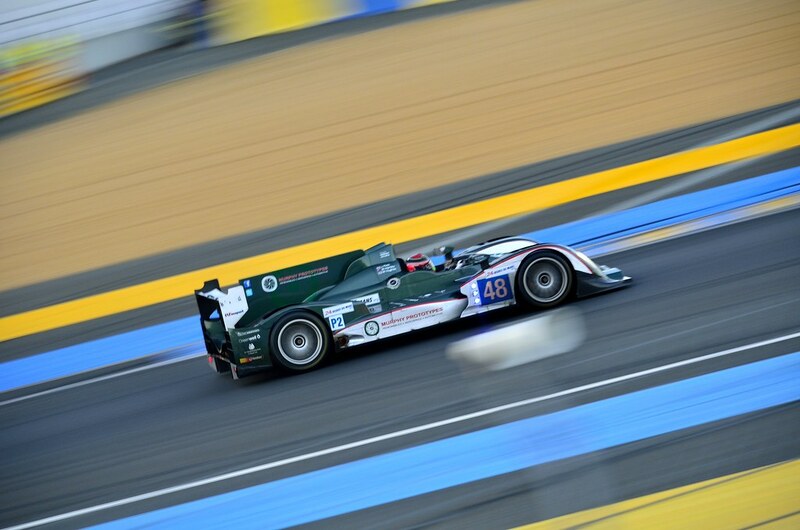 Tomorrow is Le Mans, and we have a long day in front of us. I head back to my room and open my bedroom window to let in some fresh air – and to help air out the smell of freshly painted walls. Going over my equipment for tomorrow’s race, it’s starting to rain. This will dramatically change my plans for staying the full 24 hours. 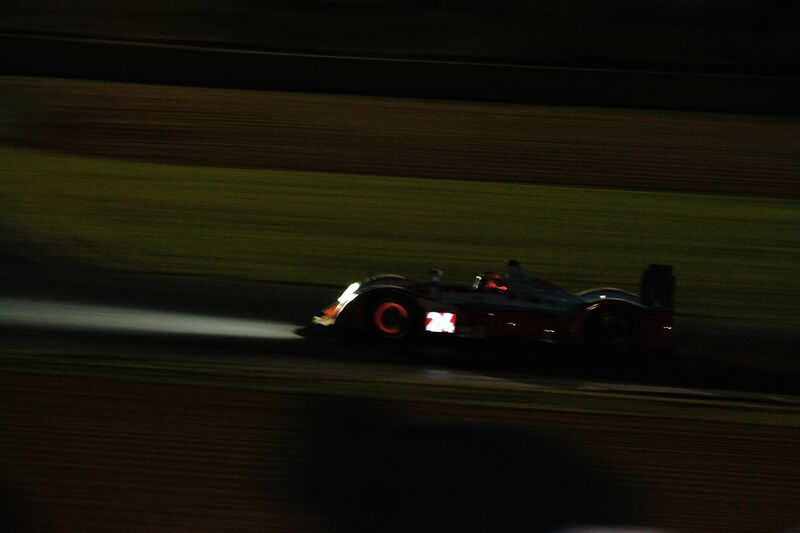 A wet Le Mans without the sunset or sunrise is not what I want. Things could change, but right now, I’m leaning towards not staying the entirety of the race. And with that, I turn in. It was an incredible day. To James, Walter, and Pascal, Roger Wills and the whole JMW Motorsports team, and Alastair Moffitt with Toyota Europe, a massive thank you for providing an incredible experience and an amazing inside view of racing at Le Mans. Thank you very much. 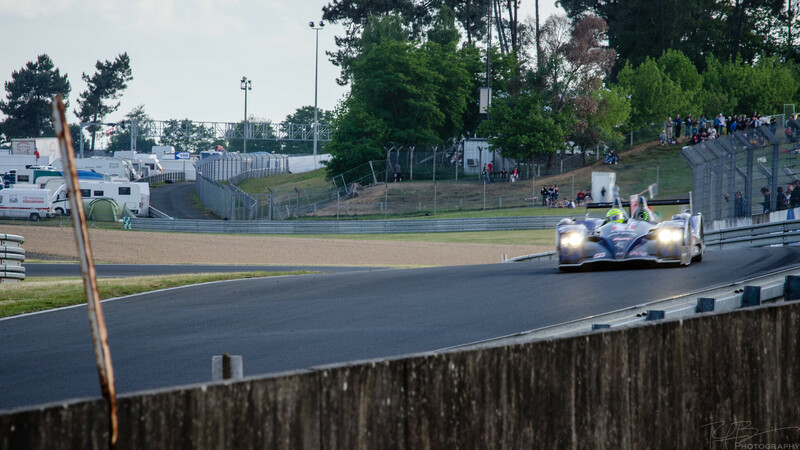 Experiencing the Le Mans in the stands is one thing, but seeing what goes into fielding a competitive team to challenge Le Mans is a different thing entirely. Out of sheer boredom and the fact there’s nothing on TV tonight, I decided to finally finish watching my DVR recording of the 2011 24 Hours of Le Mans. 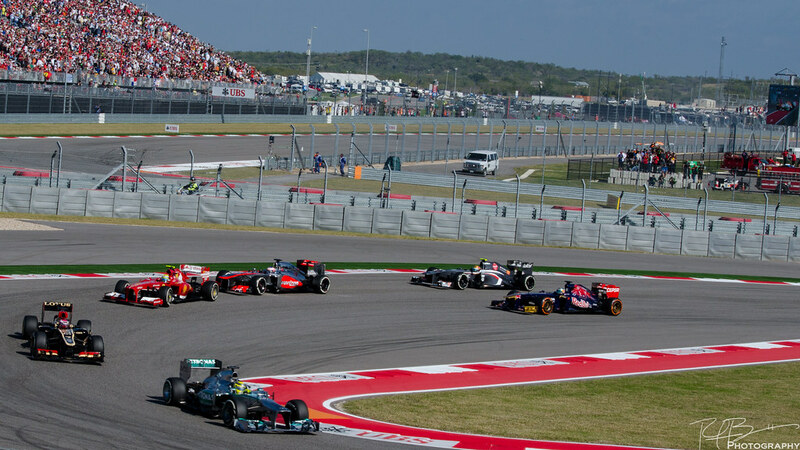 It occurred to me watching the final laps, watching the clock count down to 0:00…it’s been 6 months to the day since the race. My immediate thought: I’ve only got 6 months to plan 2012. 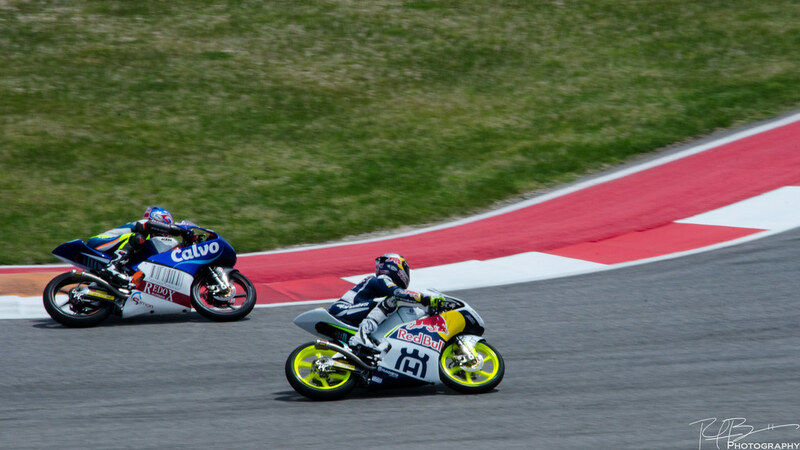 Since this summer – my first race – a week hasn’t gone by that I haven’t thought about the race. That I haven’t thought about meeting the Ten-Tenths crew. 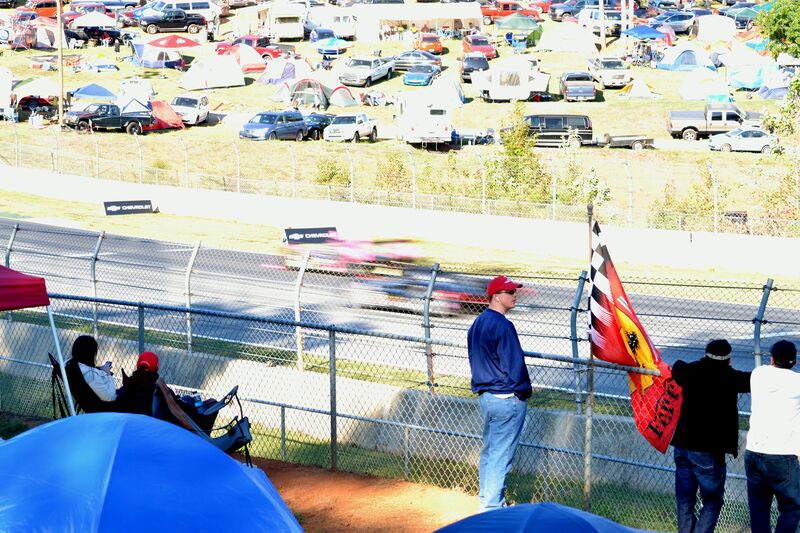 That I haven’t thought about seeing the sun come up and watching the checkered flag wave. And it seems like a blur. After Christmas and New Years, I’ll start piecing together the 2012 trip with some slight modifications. I’ll go earlier, stay longer, and know where to go. I think I saw these guys walking around the track with their equipment. 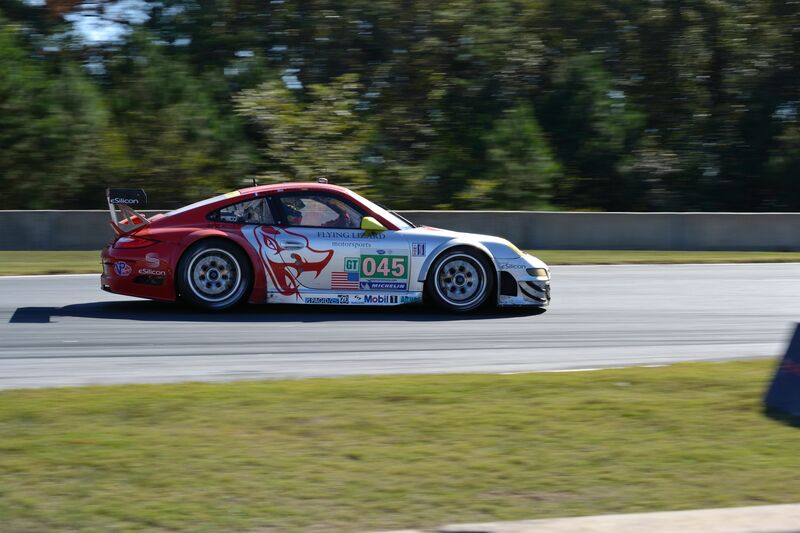 October 1st was the 14th running of the Petit Le Mans held at Road Atlanta in Braselton, Georgia. 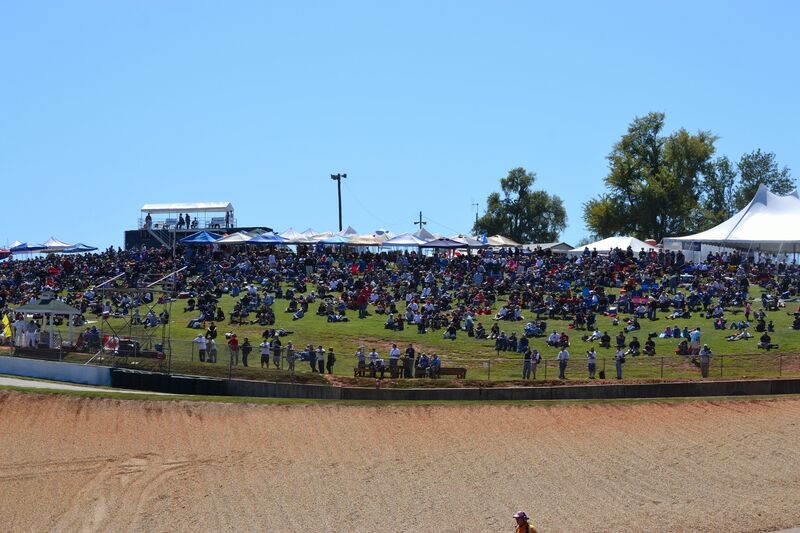 53 entries packed into the 2.5 mile, 12 turn track carved into red clay hills of North Georgia. 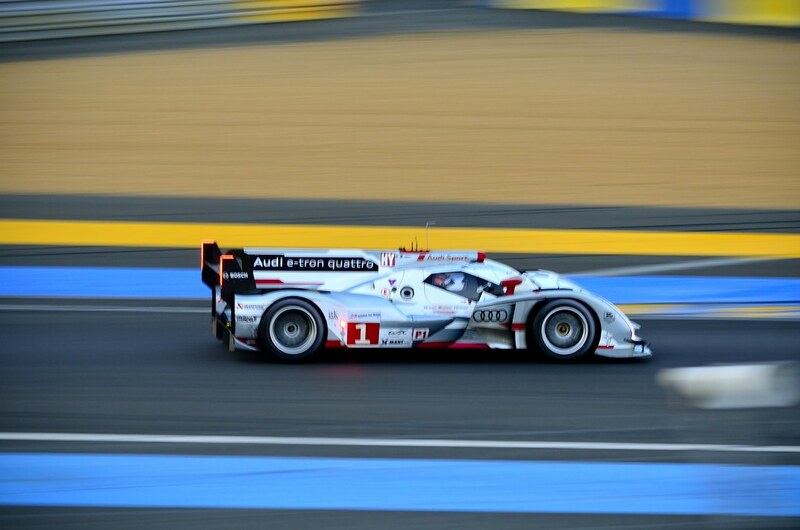 Over the past 13 years, Audi has won 9 times in the bullet-proof R8 and R10 and were looking for number 10 in the Le Mans winning R18. 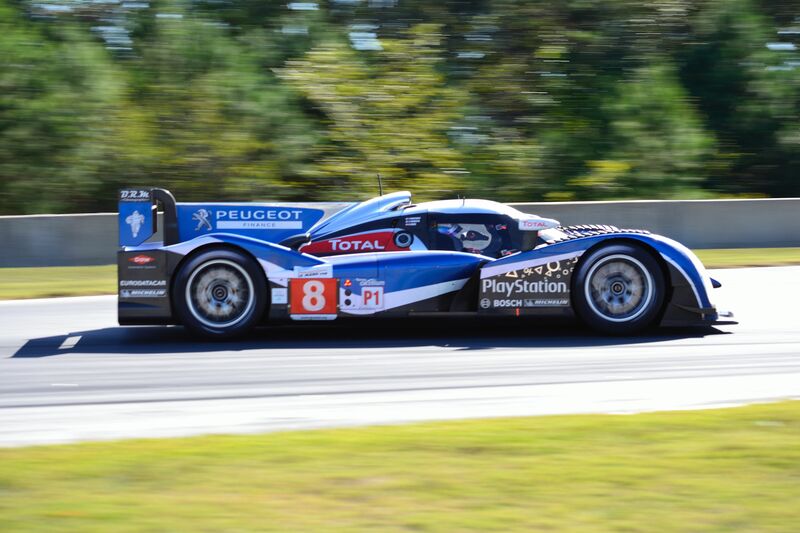 The Peugeot 908, however, has won the last two. Could they make it a hat trick? Just like at Le Mans, the Friday morning 5AM alarm is too early for my sleep-loving nature, but Dad and I have an early flight to Atlanta. We’re at DFW by 7 and in the air by 8:30. A quick two hour flight later and we’re landing at Atlanta Hartsfield-Jackson International Airport. 15 minutes later, we’re in our Chevrolet Impala heading into Buckhead – a northern suburb of Atlanta that’s filled with hotels, bars, clubs, office buildings, restaurants and car dealerships. We’re scheduled to have lunch with a commercial real estate client of ours. We’ve closed two big commercial deals and we’re working on a third with Tim and his group, but we’ve never met him – just dealt with him over the phone and through e-mail. About 12:30, we find his building, walk in, and finally meet face-to-face. After some small talk, we hop into the Impala and Tim shows us a back route through the Disco Kroger parking lot to a Gordon Biersch – a micro brew restaurant. Bob’s never been, and I’ve only been to the one on Legacy for drinks, so this works out great. Over lunch – which included some garlic fries that were overly garliced – we chat about business and get to know each other on a personal level. Tim’s a jovial fellow with a great mind for investments and he knows his stuff. An hour and a half later, he shows us another back road through a residential neighborhood to his office where we exchange handshakes and promises of future business. We’re staying at the Grand Hyatt Atlanta about two blocks from Tim’s office. We pull into the covered front drive, tell the valet we’re checking in, changing clothes and we’ll be out in 15-20 minutes. He says OK and moves the car out of the way. We get upstairs, change clothes, and we’re back downstairs heading towards I-85 to get to Road Atlanta. We cruise though the Georgian countryside, along I-85, that’s wonderfully lined with pine trees and live oaks, past Dr. Don Panoz’s Chateau Elan, and onto Highway 53. 5 Minutes later, there’s the track off to our left. Just past the track is the will call trailer where my infield parking pass awaits. Pass in hand, we enter the track and drive across the Audi bridge, past the Patron Tequlia party tent and the Vendor Village, where we find a spot just between two cars. Right, we’re set. 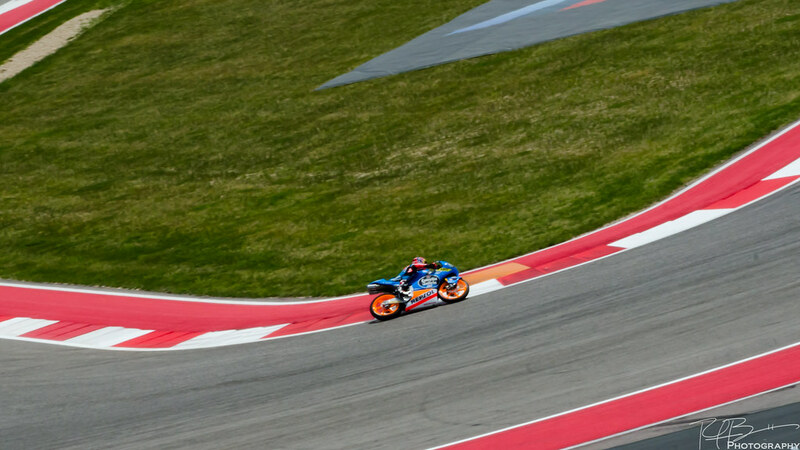 We’re at the top of the hill near Turn 2, just above the Esses. We find a spot next to the fence and settle in. 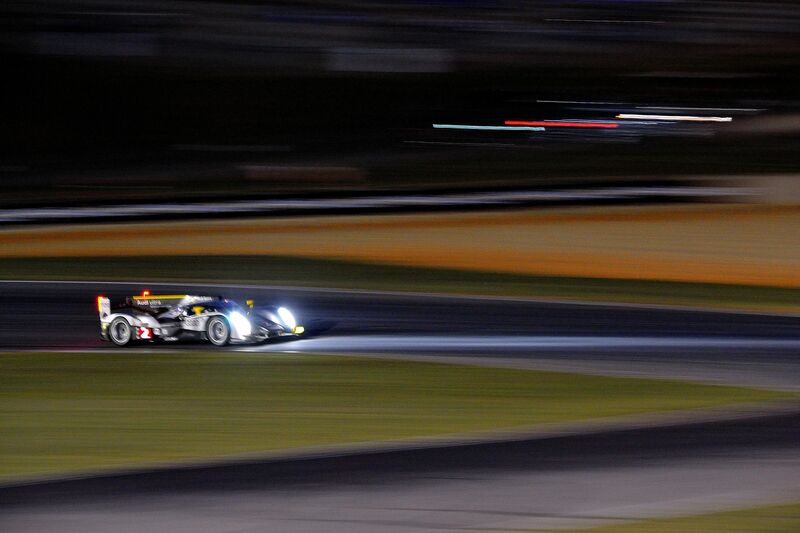 It’s about 3:30 and we’re just beginning the LMP qualifying. 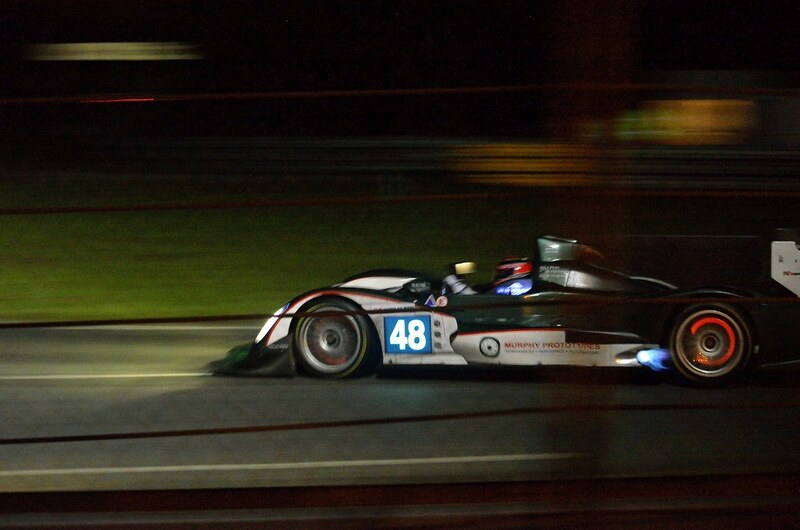 The diesels and petrol prototypes whisper and scream by. The speed at which these machines fly past us is still amazing to me. 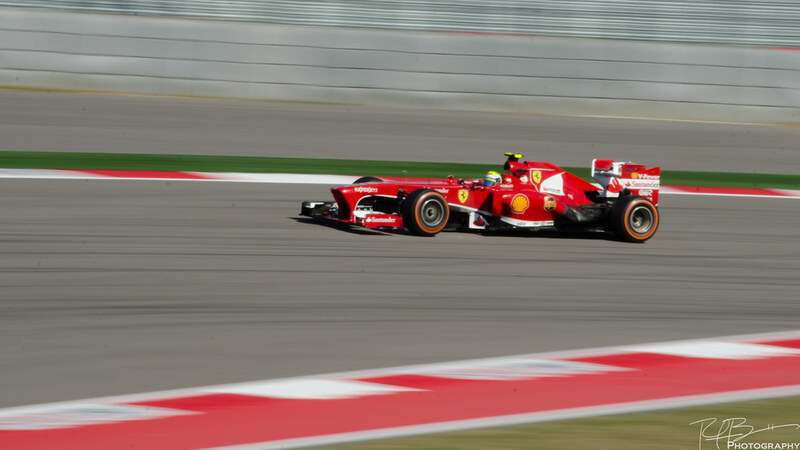 I will never grow old of seeing the speed of the cars or the talent of the drivers. Dad and I stick around to see what we see and 45 minutes later, qualifying is done. 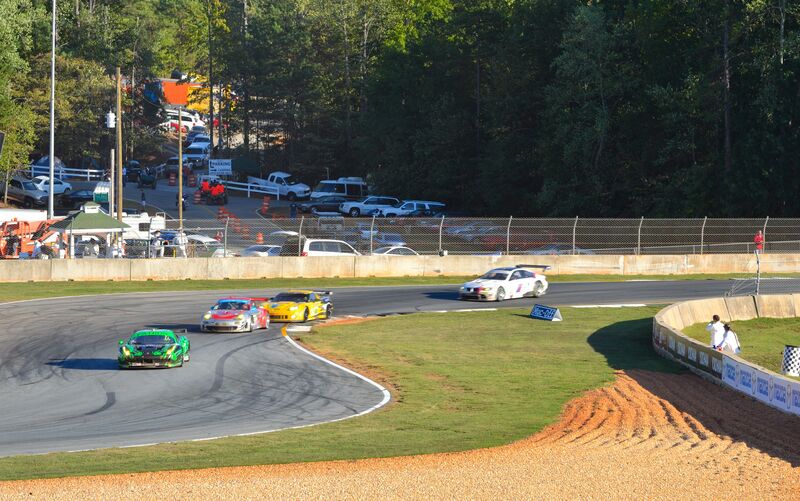 At Road Atlanta, the paddock/garage area is open to the public. Anyone can walk down at any time. As a fan, I love this. 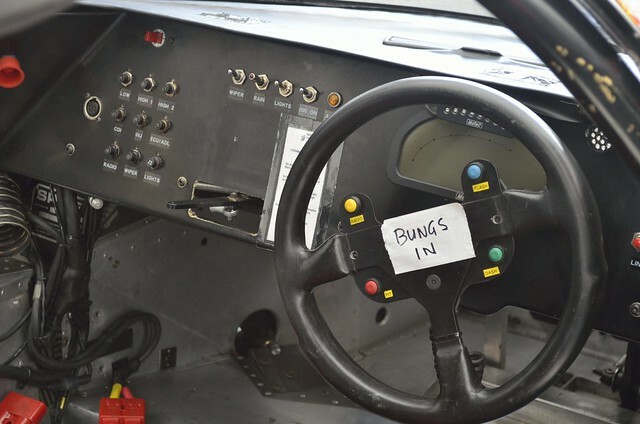 As a driver or mechanic or race engineer, I would hate this with the fury of a 1,000 suns. 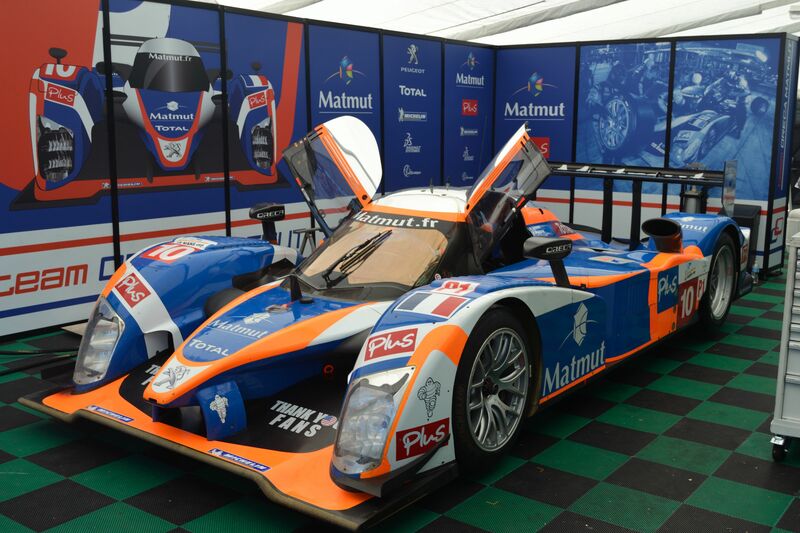 We walk down the hill towards the paddock and the first thing we see is the Oreca Matmut trailer with their Sebring-winning Peugeot HDi FAP 908. As we move in for a closer look, a pot-bellied bubba asks one of the French mechanics “How’d y’all do today?” With a wonderful French accent, he responds “Perdon?” The fan reissues “HOW’D Y’ALL DO TODAY?” in a louder and slower Southern drawl. “Oh, good” the mechanic responds with a thumbs-up gesture as he returns to his duties. Ahh, the glory and splendor of the French Rivera thrown smack dab in the middle of NASCAR country. I chuckle to myself and we move through the rest of the paddock. 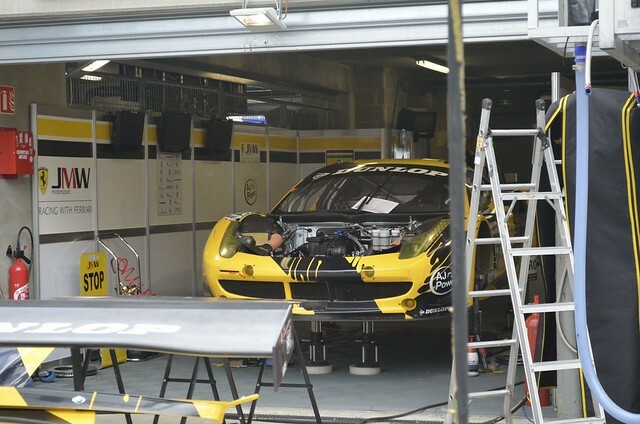 The GT cars are all in various states of repair and assembly and the LMP cars are making their way back to their garages and scrutineering. At the far end of the paddock, near pit-entry and Turn 12, we find a line of cars waiting their turn for official inspection. 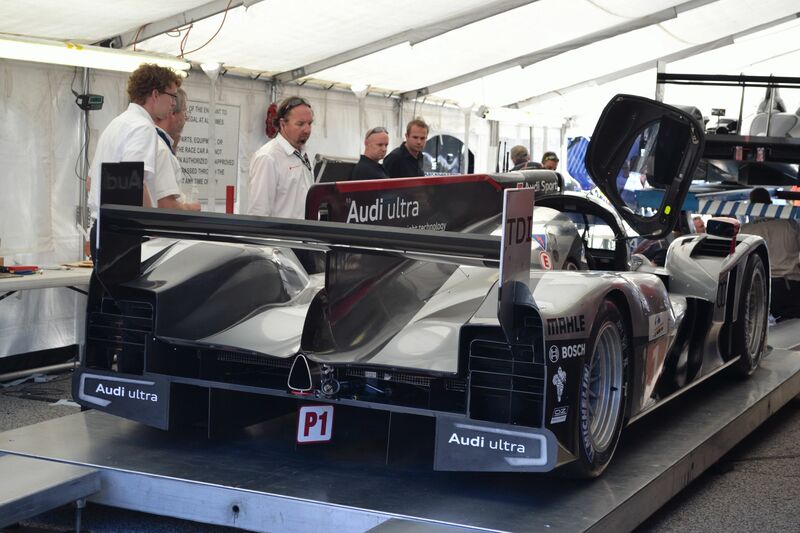 Here’s the Technical Director of Audi Sport Brad Kettler looking over the #1 Audi R18. 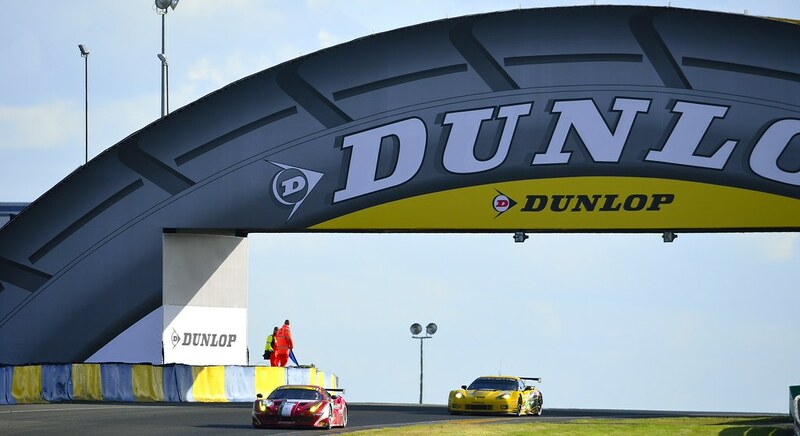 On-track, the SCCA Trans-Am support race is going on. An incredibly odd mix of Corvettes, Celicas, Jaguars, Porsches and what look like NASCAR Chevy Monte Carlos are all on track together racing. It’s about 4:30 and we have dinner plans, so we head back to the Impala and back into Atlanta. Even with some rush hour traffic, we’re back at our hotel by 6, so we hit the bar for a scotch. Dinner’s not until 7:30 and the restaurant is 5 minutes away, so why not? 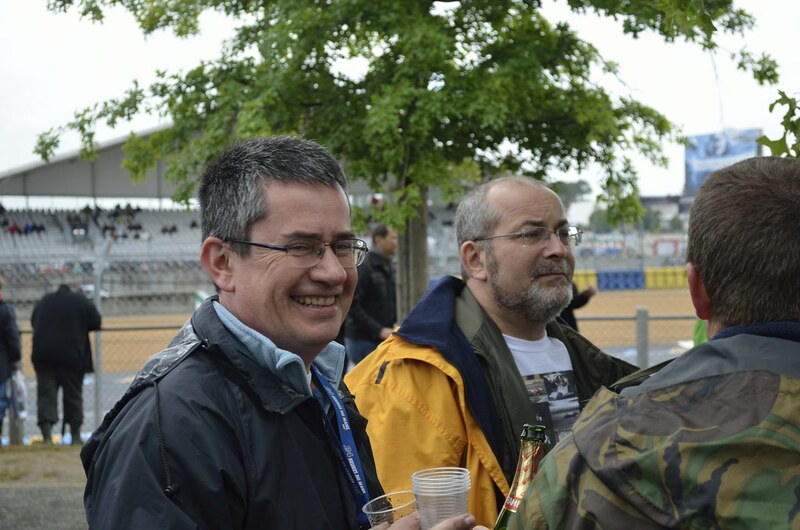 While in Le Mans, I met Clayton, Jim and Kris – all from Atlanta. Oddly enough, the four of us were the only ones from our Grand Prix Tour group to make the field trip to the Indianapolis and Arnage corners. Clay was my hotel next door neighbor and I had dinner and drinks with Jim and Kris, but our extra adventure gave us all the chance to get to know each other a little better. 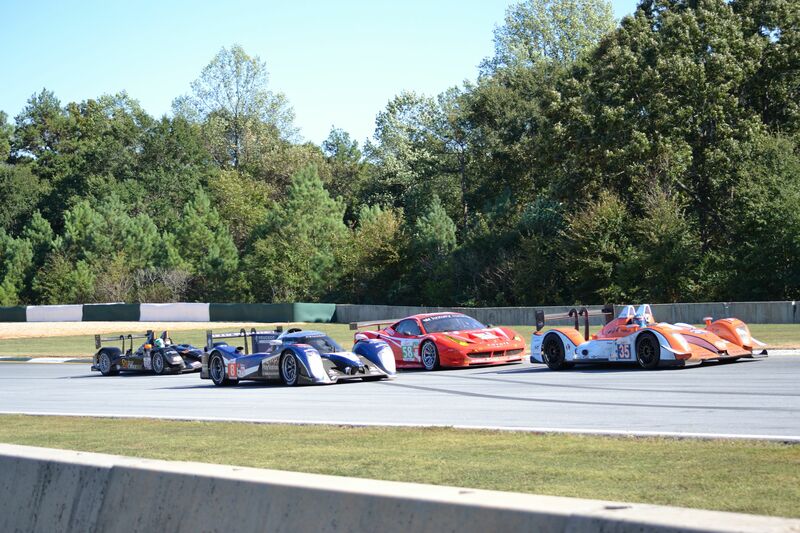 All three told me if I liked this type of racing, I need to come to Atlanta and check out Petit Le Mans. And so the seed was planted. 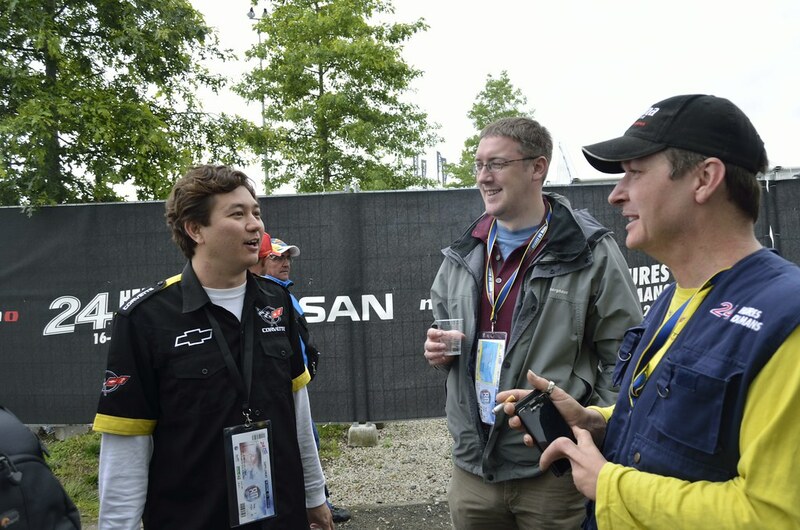 In the days and weeks after Le Mans, I was able to find Clay, Jim and Kris on the internet and started writing them through e-mail and Facebook. As I started planning this trip, I wrote them and said I’d like to meet up with them while we’re in town. Clay tells me he’s RV’ing it at the track and tells me to call when we get there and he’ll guide me to his spot. The week before the race, Jim and I made plans for the four of us to have dinner in Buckhead at this Italian restaurant Pricci – a favorite of theirs. Plus, it just happens to only be about 5 minutes from our hotel. After qualifying and grabbing quick a glass of scotch and a shower, Dad and I are out the door and on our way to Pricci. We have a wonderful 2+ hour dinner enjoying outstanding food, wine, and conversation. It is a real pleasure catching up with Jim and Kris. It’s one thing to click with someone over a short time together, and another thing to get to know someone over e-mail and online chatting, but it’s an entirely different thing to get to know someone over dinner and drinks. It is a wonderful night out. Thank you Kris and Jim for coming down and having dinner with us! 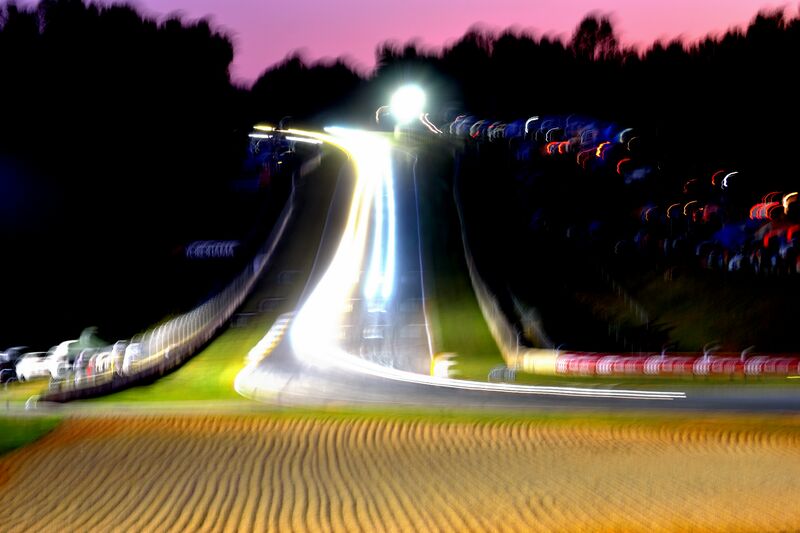 We say goodnight and make plans to catch up tomorrow at the track. Dad and I get back to the hotel where we meet up with Ted – he took a Friday afternoon flight and then caught the MARTA train to the hotel. He and I have a night cap in the hotel bar before turning in. From what I’ve read and been told, we need to be at the track early to get a good parking spot and to avoid traffic. The alarm goes off this time at 6AM – but considering we’re in the Eastern Time Zone, it’s still 5AM on my body. After a quick shower and backpack review, Dad and I are in the lobby meeting up with Ted. 5 minutes later and we’re in the car and through a crazy left hand HOV highway on-ramp, we’re on the road to Road Atlanta. 45 minutes later, we’re in line just like yesterday and we’re being waved into a parking lot recently cleared out of the trees right in the middle of the track. The placement couldn’t be more perfect. 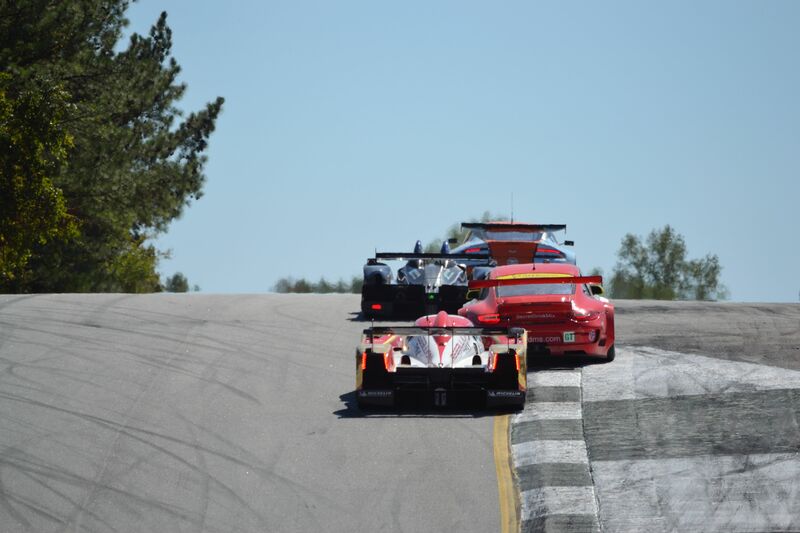 We gather up and make our way to the top of the hill near turns 2-3-4. It’s about 8:30 and we still have 3 hours before the race, it’s time to check out the paddock and get ready for the gridwalk. Heading back down the hill the same way we did yesterday, we make our way into the paddock. Past the Oreca Matmut garage and onto the main area. The teams are putting the final touches on their cars. With hoods open and rear decks removed, the engineers are giving the engines one last look over. 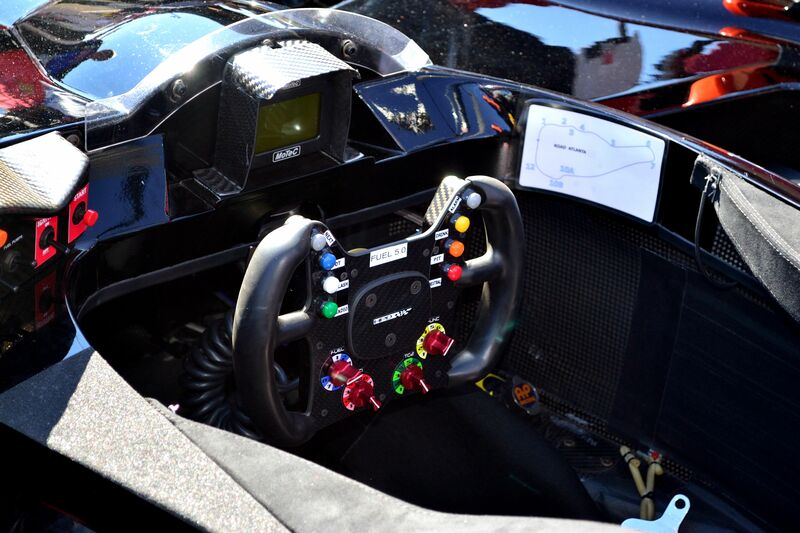 We get up close and personal with the LMP1 Oak Racing Pescarolo Judd and the LMP2 Level 5 HPD ARX-01G cockpit. I find it interesting, most of the cockpits we saw had some sort of track map positioned inside. 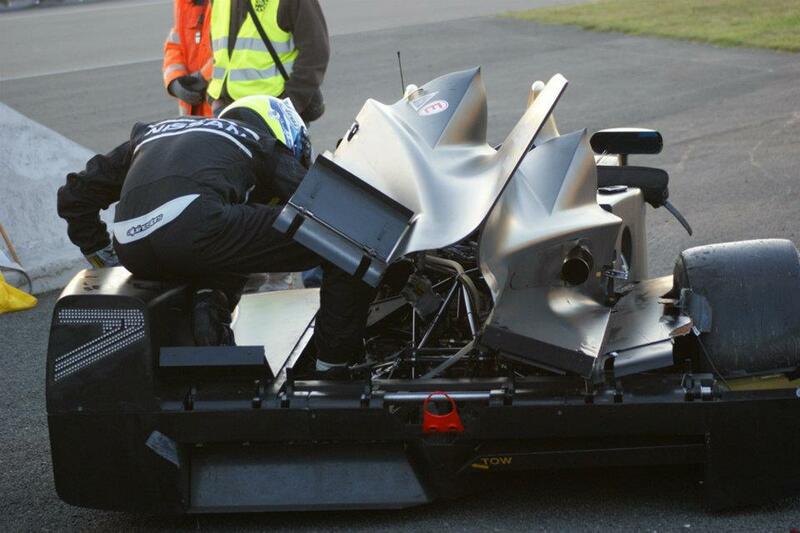 We find the Peugeot garage just in time to see the 908’s coming out of their garages. 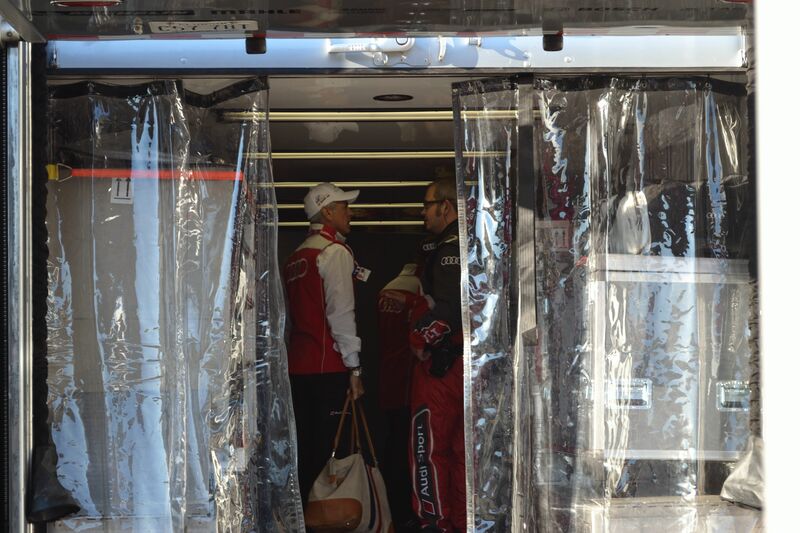 As we walk towards pit-in, we pass the various team trailers. 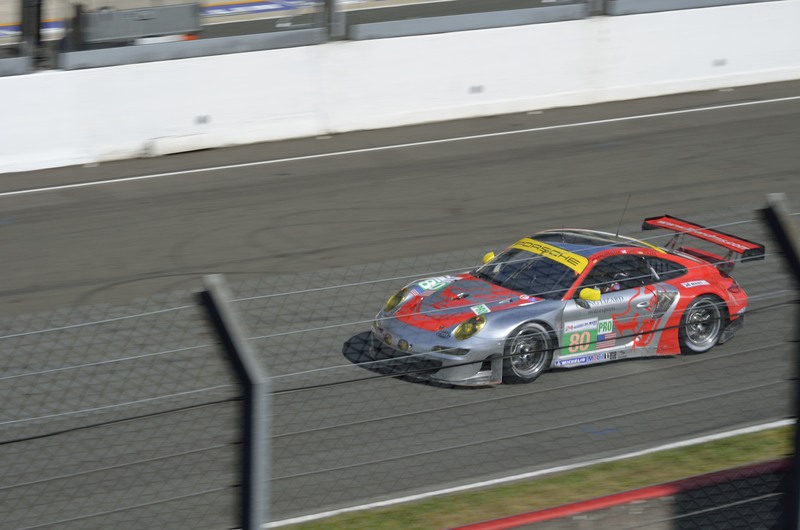 GTE Pro competitors Flying Lizard Porsche and Extreme Speed Motorsports ready their cars for the race. We get to the Audi garage and I set up camp. This is what I want to see. Looking around I see familiar faces. Familiar in that I’ve seen these guys on TV over the years. Ralf Juttner and Dr. Wolfgang Ullrich march past me towards the pit. I’m giddy in the way that a teenage girl is if Justin Bieber walks past her. Here’s race engineer Howden Haynes talking with driver Dindo Capello. 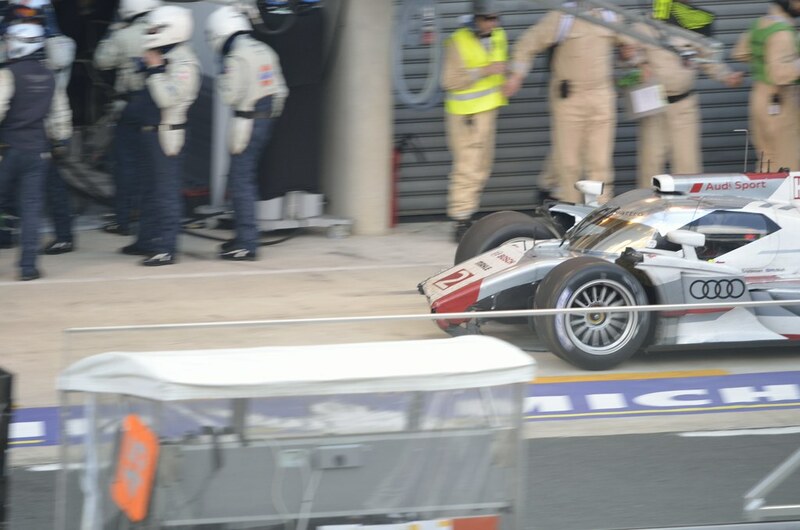 Moments later, Allan McNish exits the trailer and strolls towards me. I rattle off a few snapshots before extending my hand and wishing him good luck. He returns my handshake and says: “Thanks”. 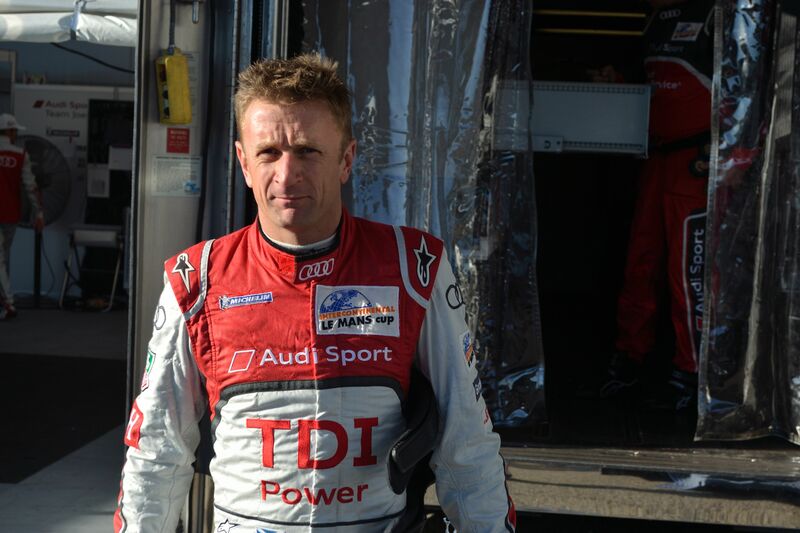 First Johnny Herbert and now Allan McNish…I shook hands with two Le Mans winners. We continue towards pit-in, taking in all that is around us. Cars are taking to the track for some practice laps and the roar of the engines is echoing through the hills surrounding us. It’s now about 10:00 and we decide to head back towards turn 1 to get into position to take part in the grid walk. 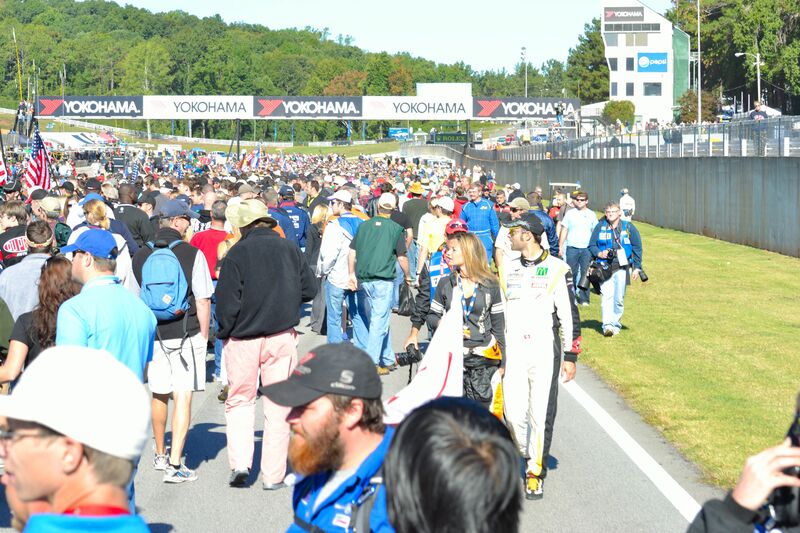 From what I understand, Petit Le Mans is unique in that the organizers open up the grid prior to the race allowing the spectators to walk amongst the cars. 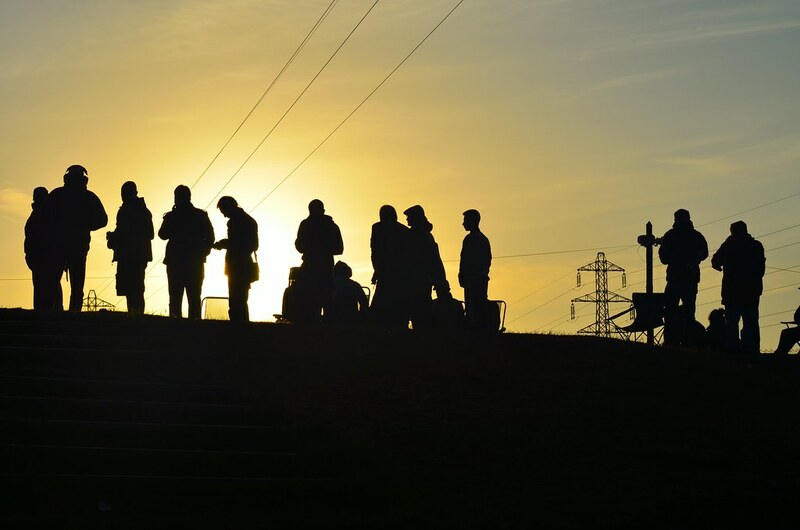 We gathered in a huddled mass behind a chain-link fence. Mechanics and engineers with tires and fuel make their way though the crowd. Over the speakers, the French National Anthem followed by the US national anthem are sung by local artists. 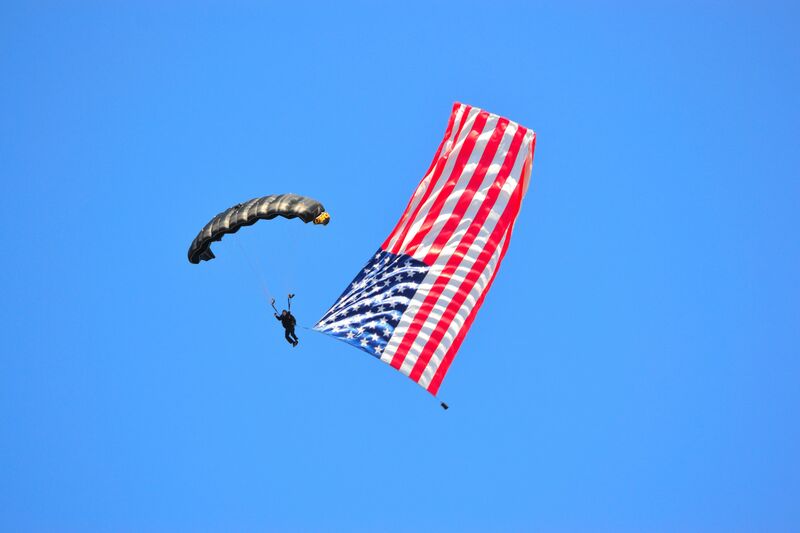 Overhead, the US Army parachute demonstration team, The Golden Knights, descend upon us. 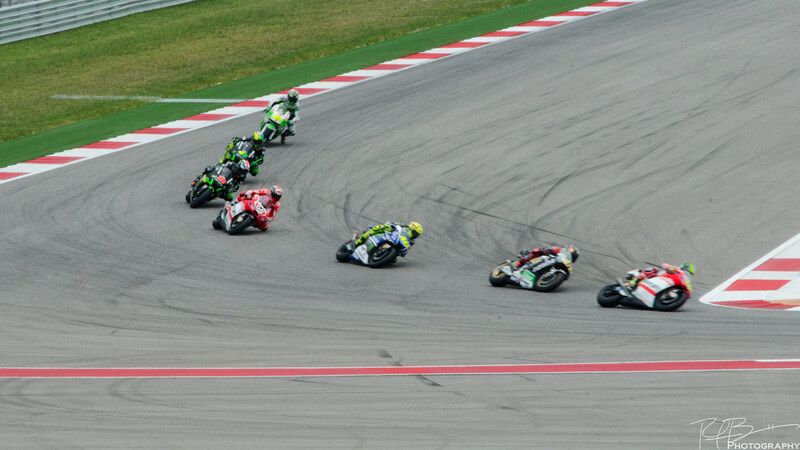 Moments later, the track announcer comes over the loudspeakers and announces the grid is open. 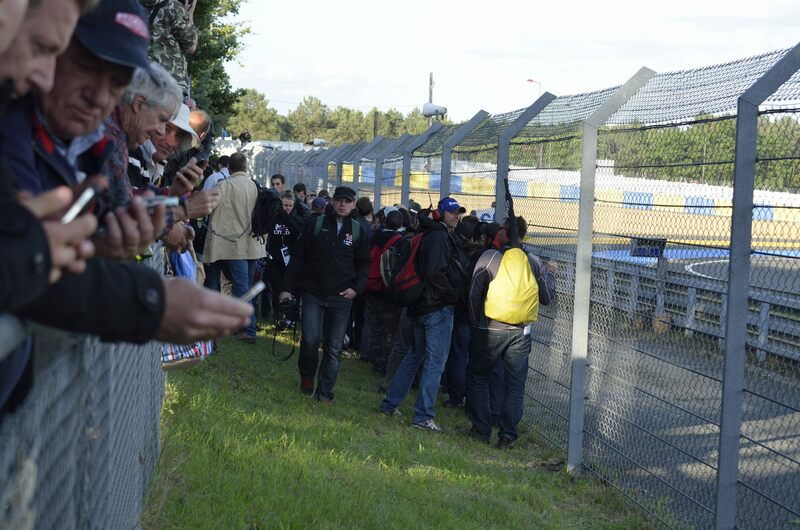 A wave of humanity descends upon the track, crowding around their favorite cars. At the front of the grid, I can barely see the cars. It’s absolutely packed and borderline maddening, but oh so very cool at the same time. 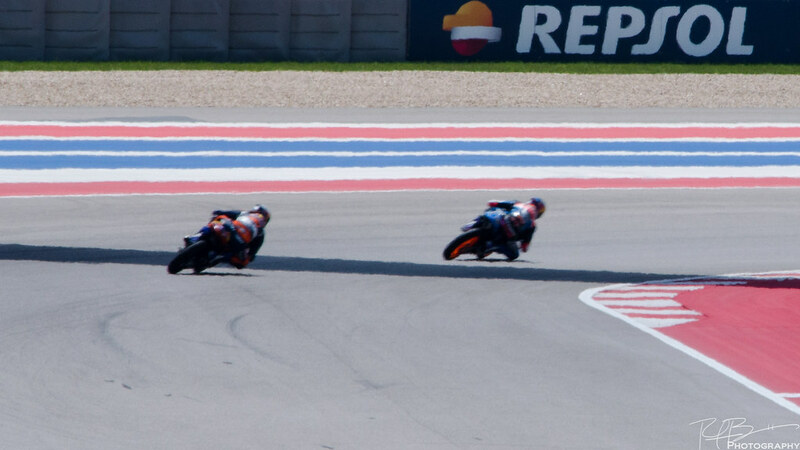 Somehow, the three of us keep up with each other, catching glimpses of cars, engineers, drivers, sponsors, and grid girls – some of whom I wish had stayed home. 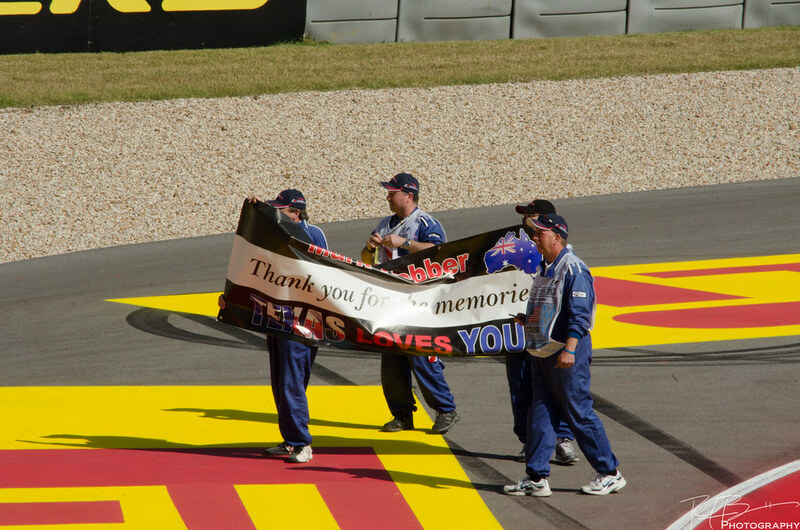 We get near one French based team – I can’t remember who – and after inspecting the car, Dad pats a driver or engineer on the shoulder and wishes him “bonne chance.” We get near Turn 12 and decide to make our way back towards Turn 1 through the pit lane. 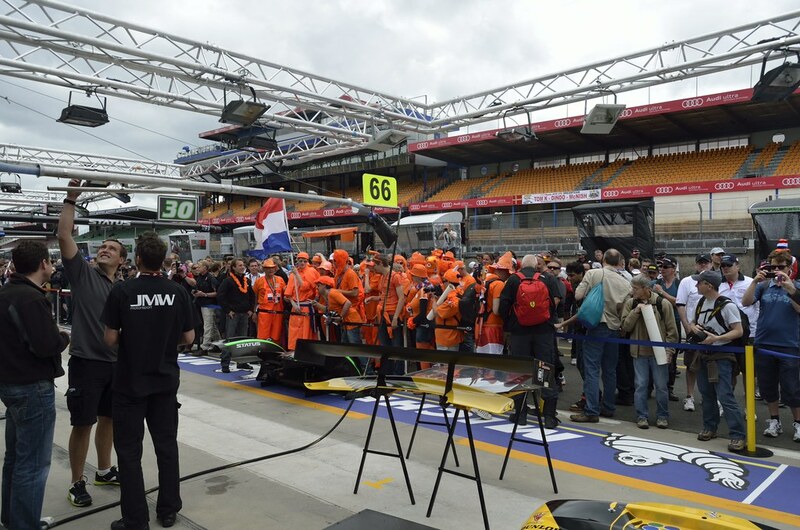 There are several cars starting from the pits and we take a closer look. But cars aren’t the only thing worth looking at here. Here’s Dad and some of the Buffalo Jills – the cheerleading squad of the Buffalo Bills. Huh? Dad asked why they’re here and it turns out, one of the LMPC drivers is from Buffalo, New York and they were down to show their support. Given the opportunity, I’d head to Atlanta from Buffalo any day of the week and twice on Sundays. Through several new friends we’ve made on-track, we’ve been told to position ourselves near Turn 1 for the start of the race. 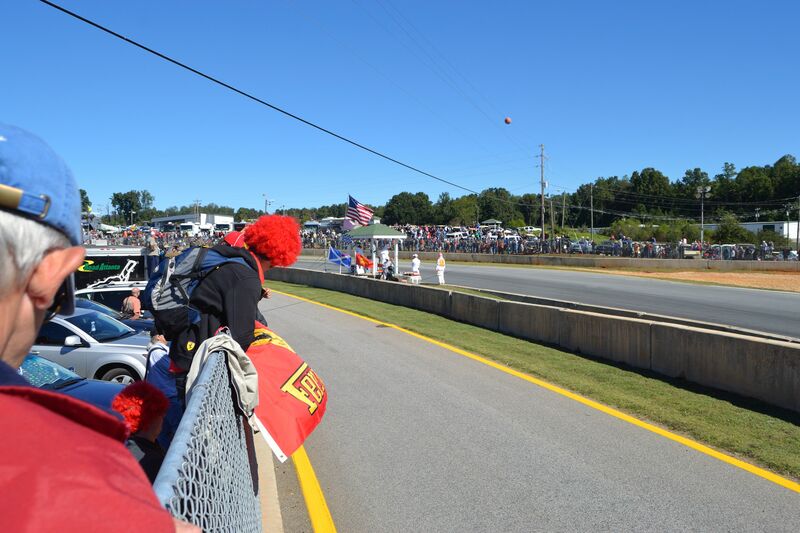 So we make our way down pit lane where we find an empty spot on the wall overlooking Turn 1 and pit-out. We hoist ourselves precariously up onto the wall, clinging to a sagging chain link fence. 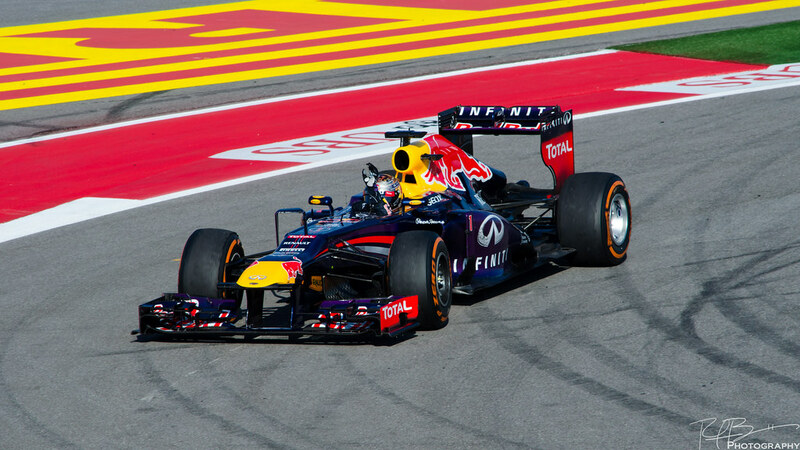 As the cars exited pit-out, just under where we were standing, the vibration through your body was considerable. I felt the cars as much as I heard them drive past us. We stick around for a few laps before we head up the hill and towards the Vendor Village. 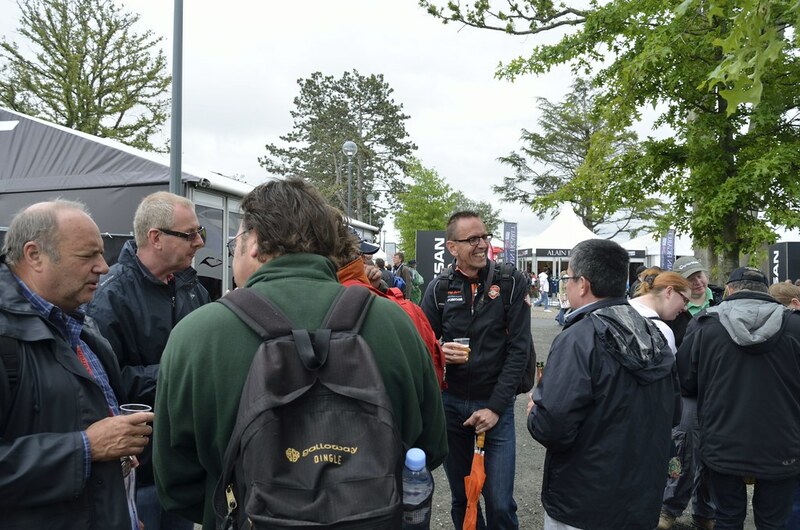 Similar to the ACO Village in Le Mans, but considerably smaller, we check out the vendor stands and exhibits before grabbing lunch and a beer. 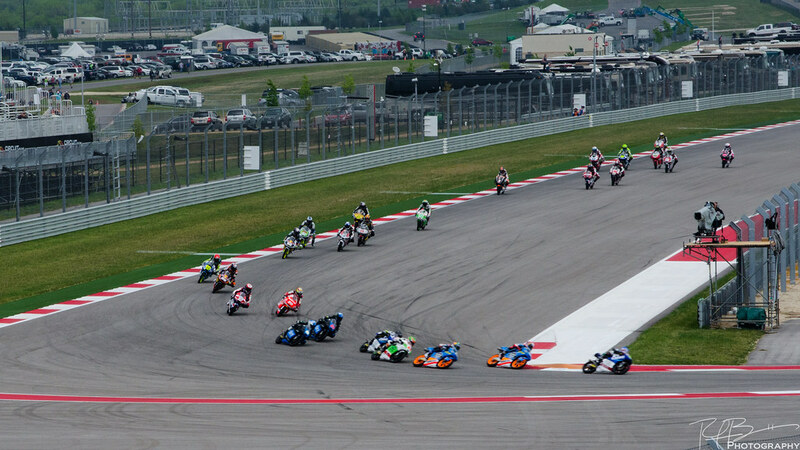 Finishing up, we decide to make our way to Spectator Hill overlooking The Esses. We head to the car and grab our folding chairs we bought last night at Sports Authority. The initial walk is a pleasant downward slope but we’re quickly greeted with a substantially greater incline than one would expect. Slowly passing us on our walk are random cars and golf carts. By chance, I turn around just in time to see a gentleman alone in his golf cart decorated with Christmas tree lights. On a lark, I stuck out my thumb to hitch a ride. He stops right in front of me and waves us on. Quick introductions are made and we start chatting. 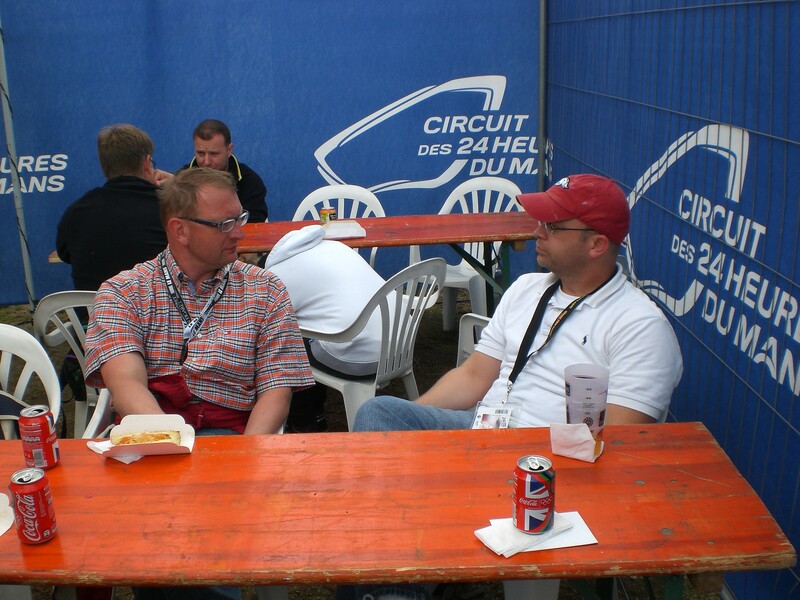 We tell him this is our first time down and he tells us about dinner last night with Dr. Don Panoz and a funny story Dr. Panoz told comparing the nicotine patch with a condom – ask me offline and I’ll tell you. He’s with some buddies in the Mazda hospitality tent at the top of Spectator Hill and is camping on the outside of the backstretch. He tells us where and invites us to join him and his friends later tonight. We park, shake hands, and bid each other farewell. We find an empty spot and set up camp. Absolutely perfect. It’s exactly as I imagined it. There’s a big screen in front of us and live commentary being broadcast over the speaker system. Add the fact there’s a beer/food stand almost right behind us and a clear, blue sky overhead, and it’s a perfect combination. We find an empty spot at the top of the hill and enjoy the cars race past us. Dad decides he wants to get a little closer to the action so he makes his way down towards the track. About 15 – 20 minutes later, he comes back and tells us the #2 Audi has some damage and has colored duct tape holding the rear deck together. It’s about 1:45 and it turns out while we were in the Village getting lunch, Tom Kristensen collided with the Robertson Racing Ford GT in Turn 10B causing damage around the right rear tire. 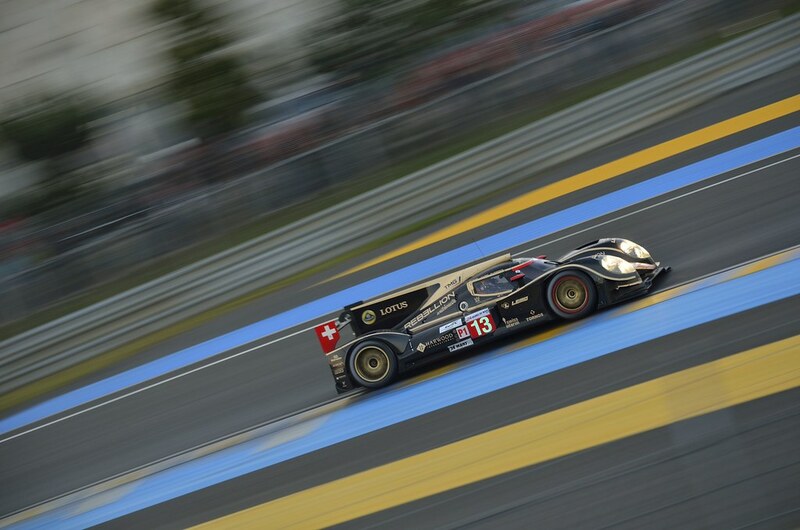 And now, we notice there’s only one Peugeot 908 circling the track. Just a few minutes ago, the pole sitting #7 908 with Sebastien Bourdais behind the wheel, pulled off-track retiring with mechanical problems. 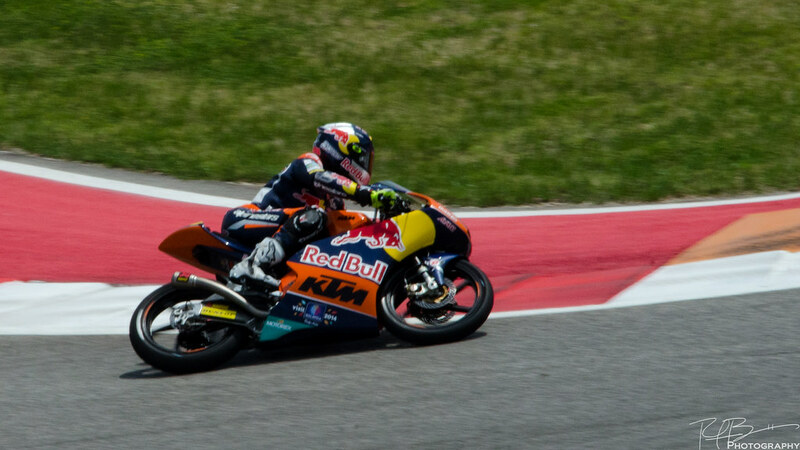 Even with the big screen TV and commentary coming over the loud speakers, it’s still hard to keep up with the race action unless it happens right in front of you. We stick around for an hour or so before I want to check out the cars from a different angle. Dad wants to tag along so we leave Ted and make our way to the bottom of the Esses and look up as the cars fly past. 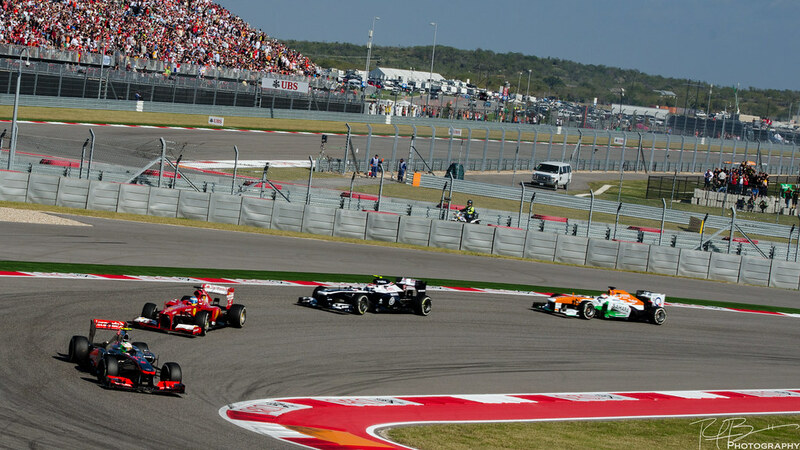 From where we are, the cars move down the Esses towards us from the left into Turn 5 before climbing the hill and disappearing on their way towards Turns 6 and 7 and Spectator Hill is up to our right. We’re just coming out of a safety car period and the cars are all stacked up. It’s really cool watching these cars zoom past as they wind down the hill and rocket up past us. 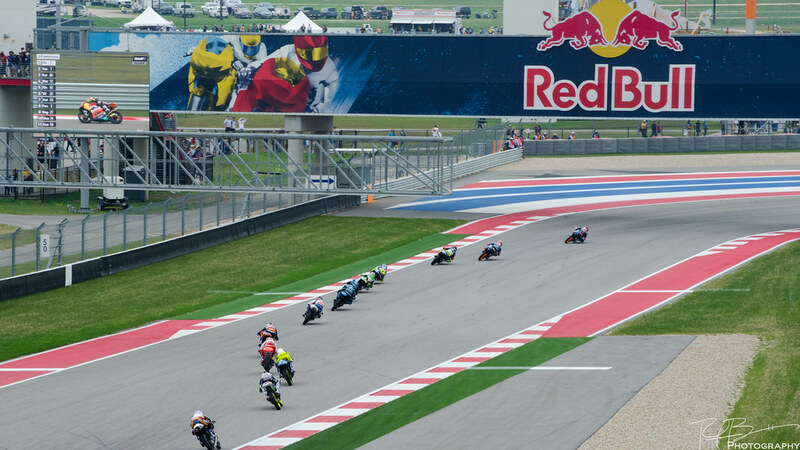 We catch some race action for an hour in various spots before making our way back towards Ted. It’s about 3 o’clock and we decide to make our way to Turns 6 and 7. A quick 20 minute walk through the RV parking lot, we find a spot on the wall in between Turns 6 and 7. The cars are right there, 20-25 feet from us as they enter Turn 6 to our left and slow down dramatically for Turn 7 before they jet off down the straight. 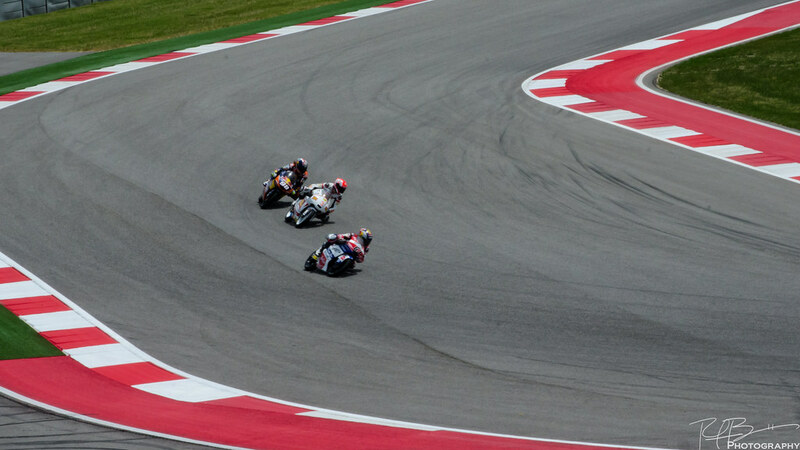 We stick around for 30 minutes or so before deciding to head down to Turns 10A and 10B. It’s about 4:00 and we get to the Mazda bridge over the backstretch. Crossing the bridge, there’s a wonderful engine whine echoing through the trees. Mix that with the swoosh of the cars as they stream beneath us as well as the rocking of the bridge caused by the aerodynamic wake from the cars and it’s an incredible experience. Looking down through the slats of the walkway, you can see the cars for a fraction of a second. 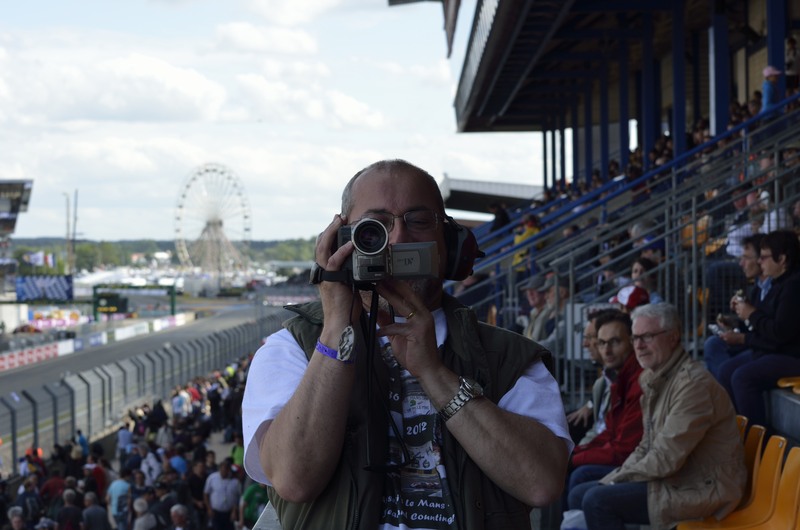 Putting my cinematographer hat on, I place the camera looking down through a gap to capture the cars as they roar off towards turns 10A and 10B. Crossing the bridge to the outside of the backstretch, we walk past RV after RV and make our way to the braking zone going into Turn 10A. The aches and pains of walking around for the past 8 hours are moving in, so we find an open spot and settle in. Dad decides he’s going to check in with mom and Ted makes his way towards the track to get up close and personal. After hanging out for an hour or so, we decide to make our way to the area overlooking Turns 10A and 10B to watch the end of the race. 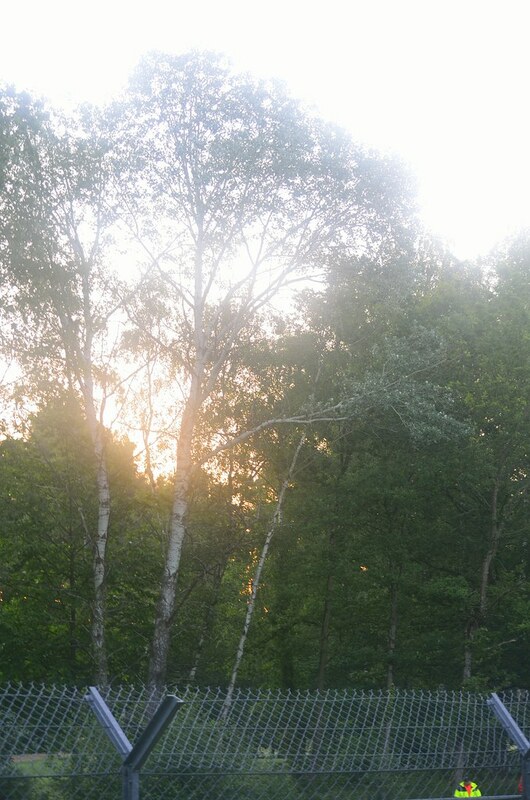 It’s about 5:30, and with the sun setting behind us, the temperature’s dropping. We find an open spot in the spectator area carved into the hills overlooking 10A, I turn on my phone to check for a signal – it’s been spotty all day so I’ve been keeping my phone off to preserve the battery. I get a flood of texts. My beloved Arkansas Razorbacks have come from behind to beat Texas A&M at Cowboys Stadium! Behind all game, they took the lead with 1:40 left in the game. Everyone tells me it was quite a game. That’s great, but we’re watching quite a race. About that same time, roughly 6:00, I get a text from Jim and Kris – they’re doing the same thing we are and are heading our way to watch the end of the race. Looking of to my right, towards the tunnel underneath the track, I keep my eyes pealed for Jim and Kris. In short time, I see them moving my direction. I flag them down and the 4 of us catch up and I introduce them to Ted. We line up and prepare for the last few remaining hours of racing. Before we know it, we’re in the middle of another safety car period. 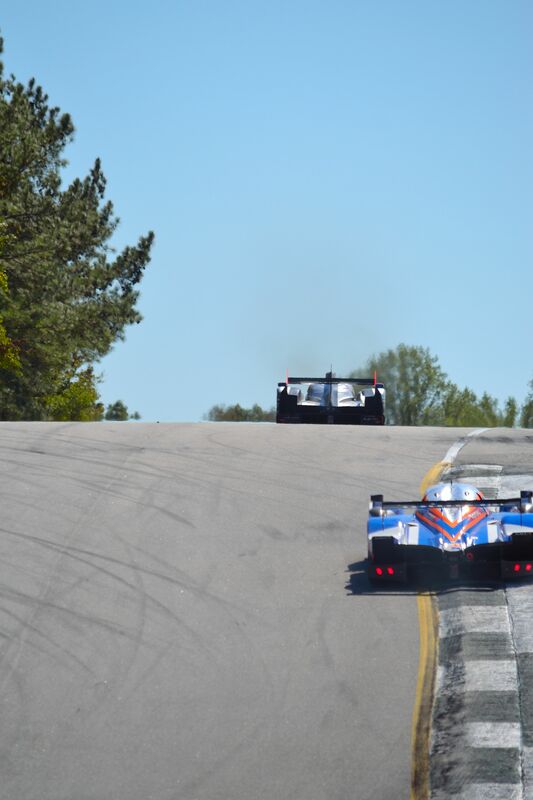 Just a few minutes ago, the 2nd place Audi driven by Romain Dumas got an excellent jump out of Turn 7 and was making a move on the lead 908 driven by Franck Montagny. 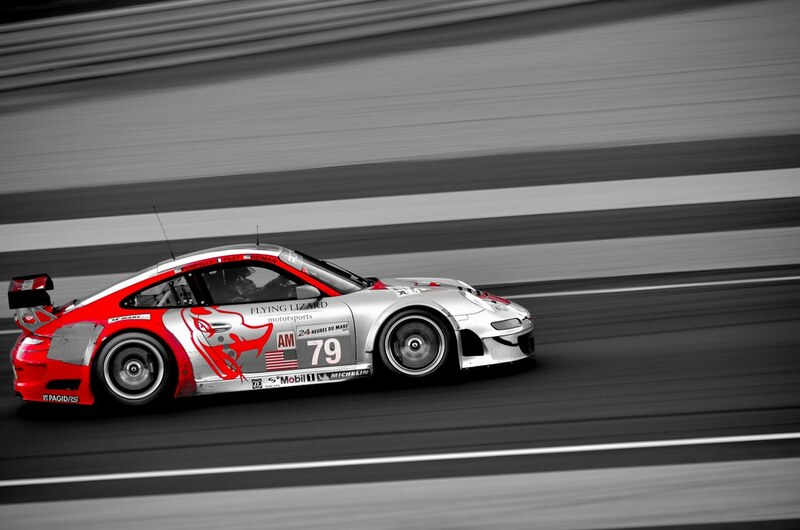 In the way, however, is a Porsche 911 GT3 Cup car. 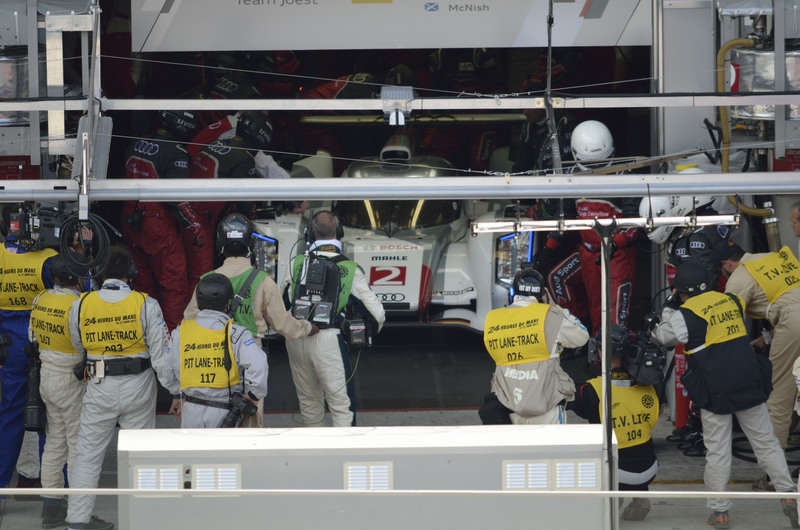 Depending on whom you talk to, Dumas misjudged the gap between his Audi and the Porsche or Montangy moved over to close the door causing the Audi to clip the Porsche. Either way, the Audi and the Porsche came together and careened into the wall near the Mazda bridge we crossed just a few hours prior. 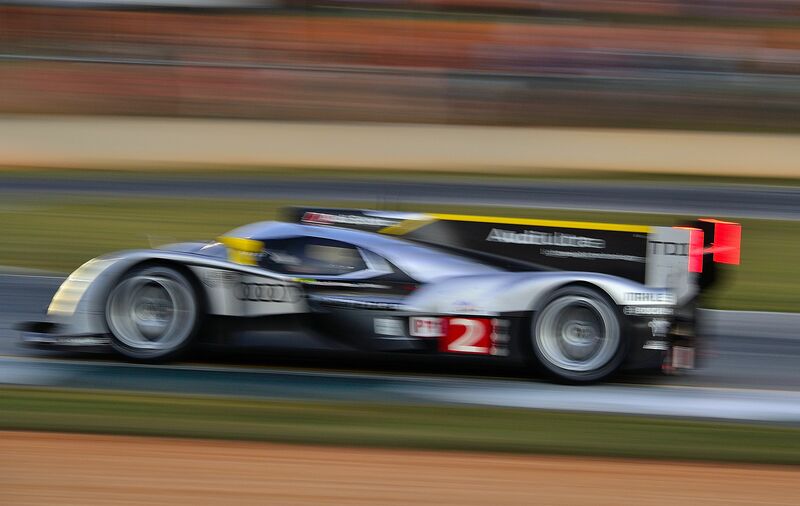 It’s an unfortunate end to an otherwise excellent race between Audi and Peugeot. It’s nearing 7:00 and the shadows are getting longer. 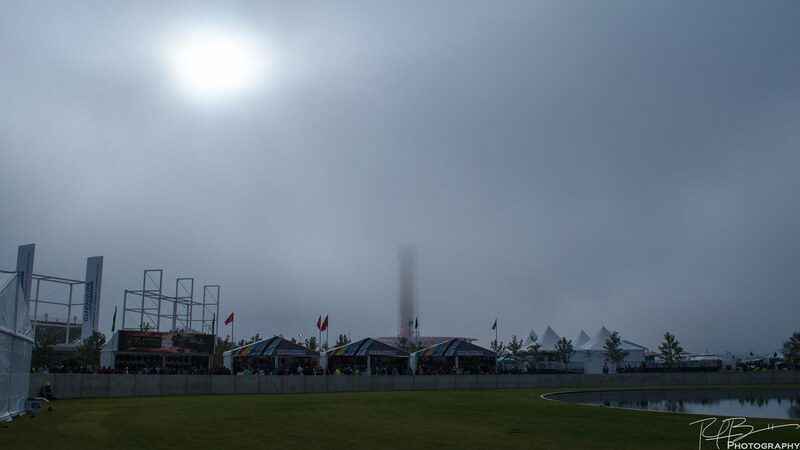 Just like at Le Mans, it’s starting to get cold. Our car, according to Jim and Kris who parked in the same parking lot as us, is just through the tunnel under the track and a short 10 minute walk away. Ted, Dad, and I all have warmer clothes back in the car. Being the virile, young bucks we are, Ted and I volunteer to head to the car to grab warmer clothes. 30 minutes and several additional layers of clothing later, we’re all back together. We’re a little less cold, but a lot more hungry. Dad, Ted, and I decide to cross the Audi bridge and head for some grub in the Village. The pickings are slim, but we all grab a pretty good pulled pork bar-b-que sandwiches and they’re devoured in short order. Heading back towards Jim and Kris, I wish I’d brought my tripod. 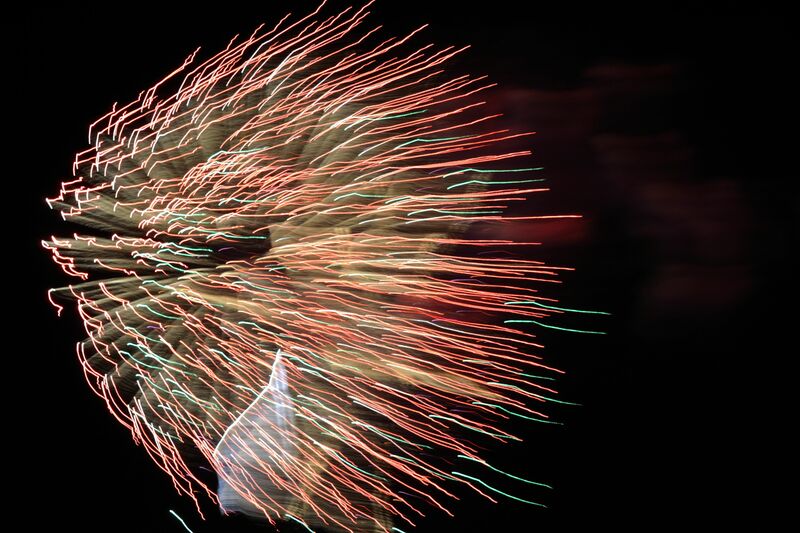 With as steady a hand as I could muster, I’m able to pull off this 4 second exposure. 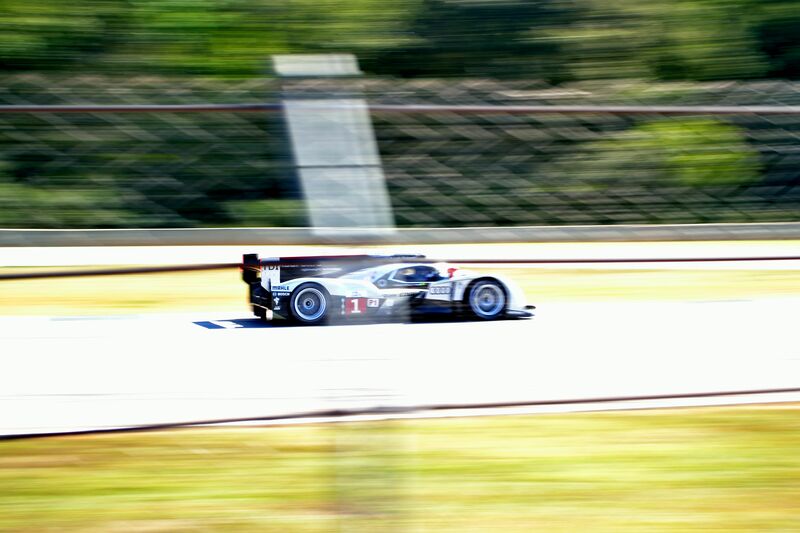 Crossing the bridge, I capture the #2 Audi racing for pride as he’s more than 70 laps down after dealing with various mechanical gremlins. 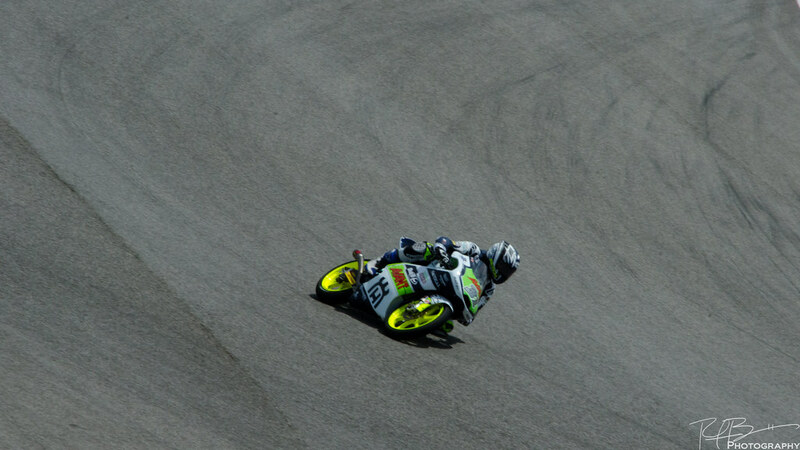 Once we get back to Jim and Kris, Dad spots the #24 Oak Racing had a pretty strong forward brake bias and his rotors were still lit up as he headed into Turn 12. 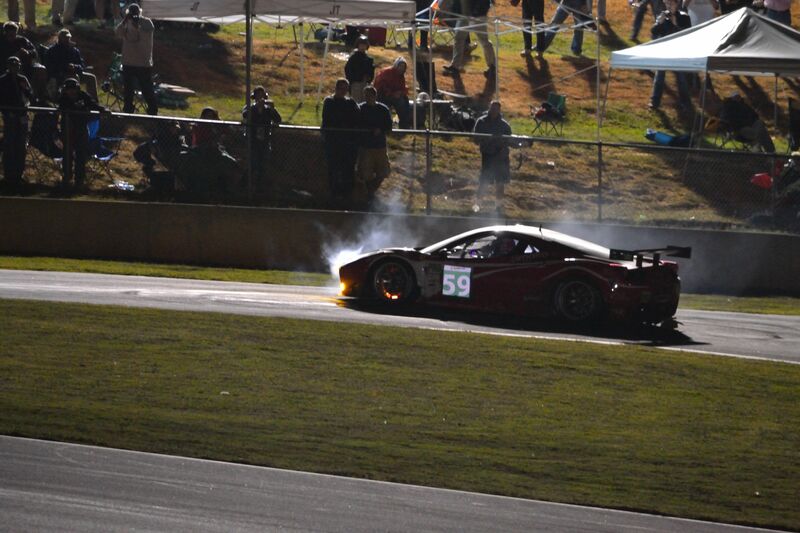 And speaking of lit up rotors, the #59 Luxury Racing Ferrari F458 had a little problem as he pulled off-track. 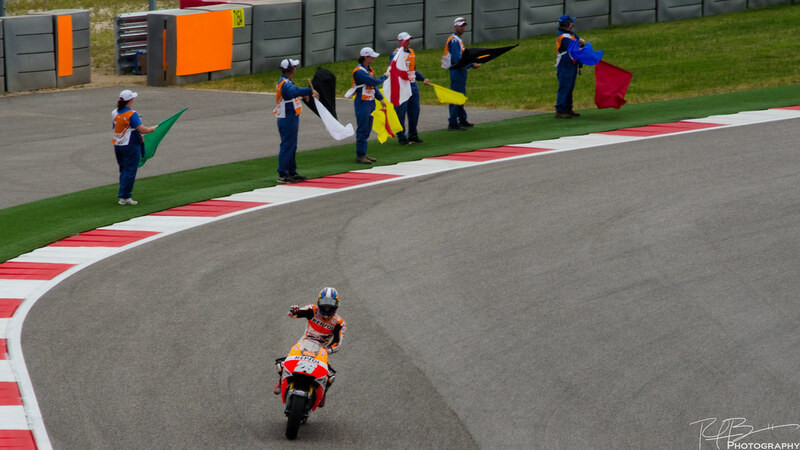 He’s on fire but a marshal is Johnny-on-the-spot and the fire is quickly extinguished. 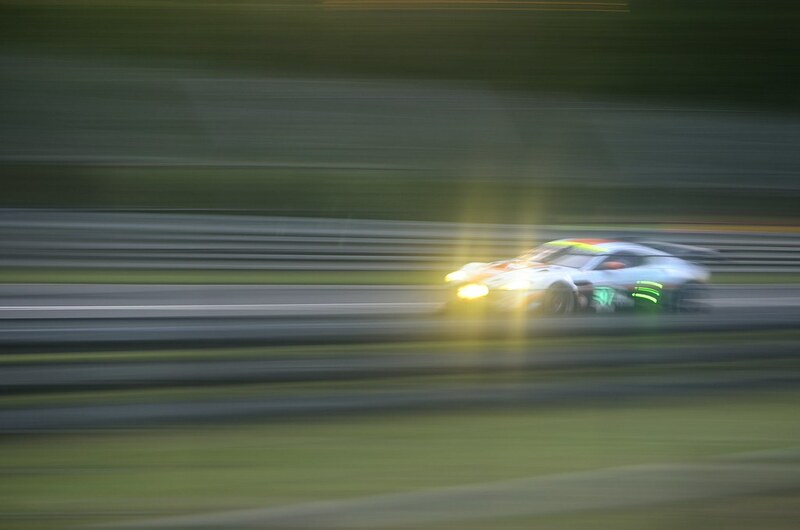 The cars continue to stream past us and before too long, we have our last safety car period. 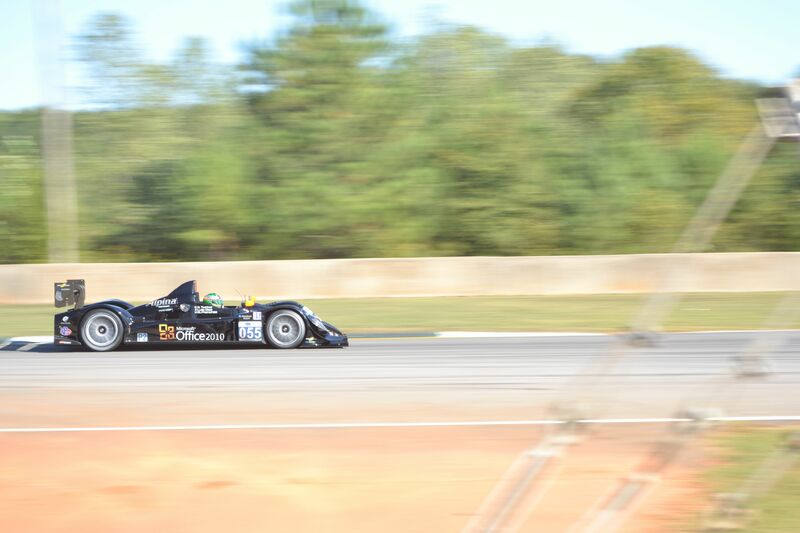 Just a few minutes ago, Chris Dyson in his Mazda powered Lola clipped another car at the top of the hill in Turn 3. 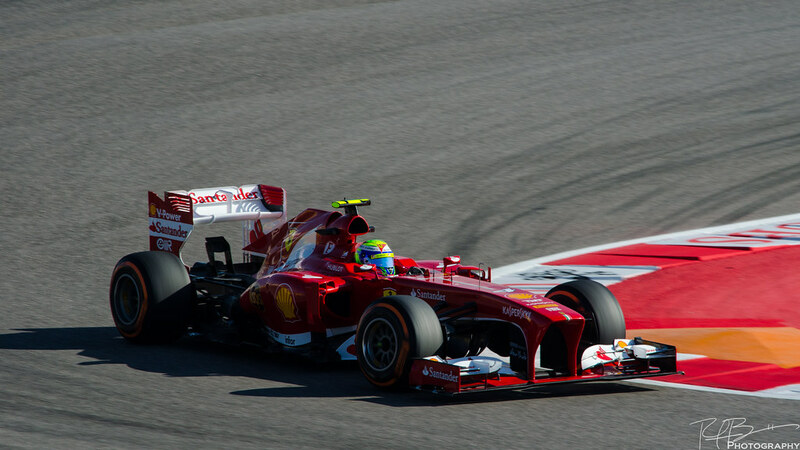 Several cars behind him got caught up in the chaos and went off-track, bringing out the safety car. 7 laps left. 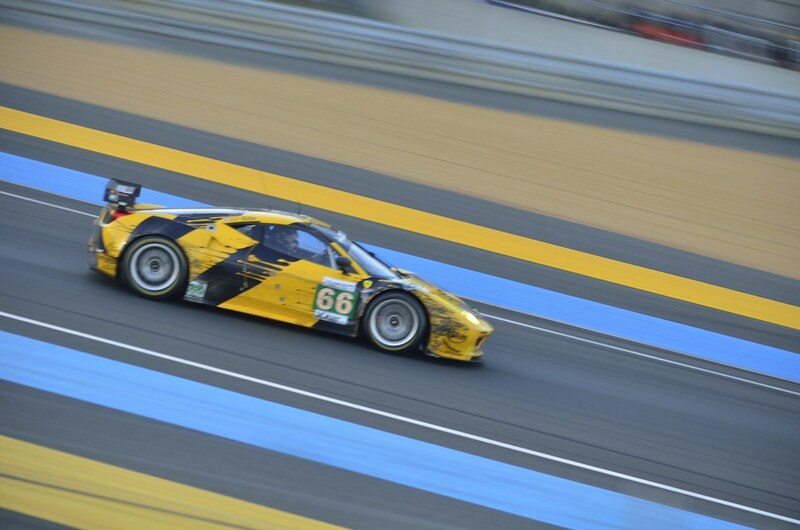 While the LMP1 race is all but decided with the #8 908 in the lead with a 5 lap cushion, the GT race is far from over. With 3 laps remaining, we’re green and racing again. 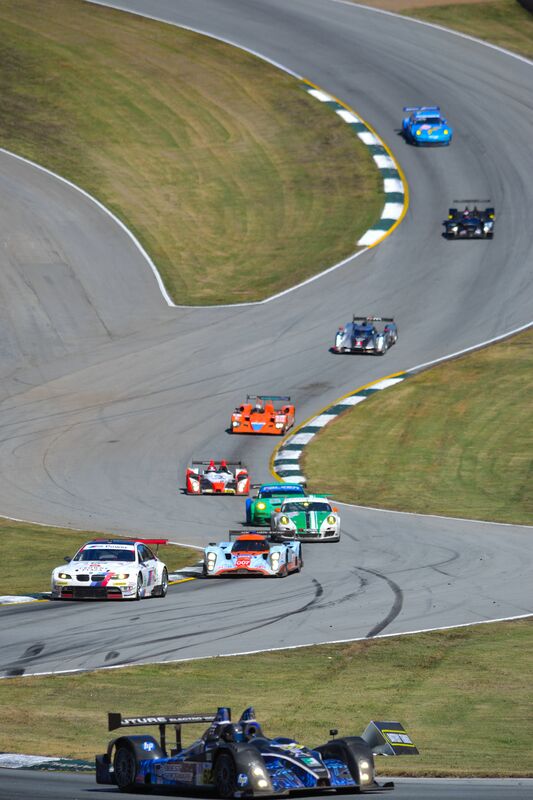 After 9 hours of racing, it becomes a 3 lap sprint race between Ferrari, BMW, and Porsche. 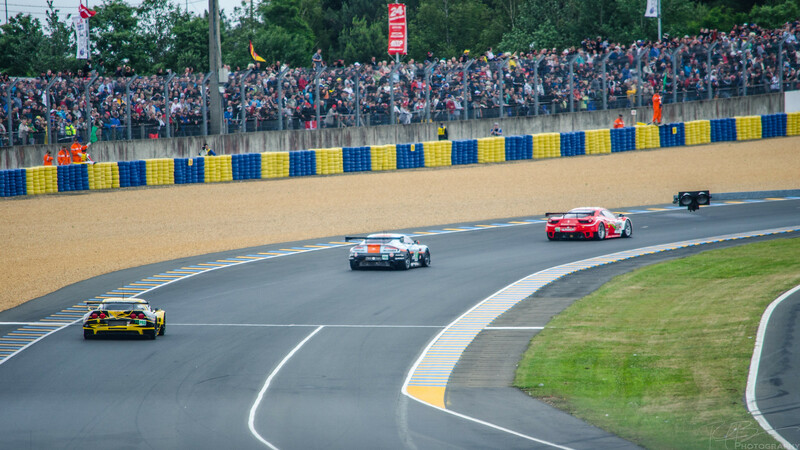 At Turn 7, with two laps left, the Flying Lizard Porsche passes the BMW M3 GT for second while the AF Corse Ferrari F458 stretches his lead. 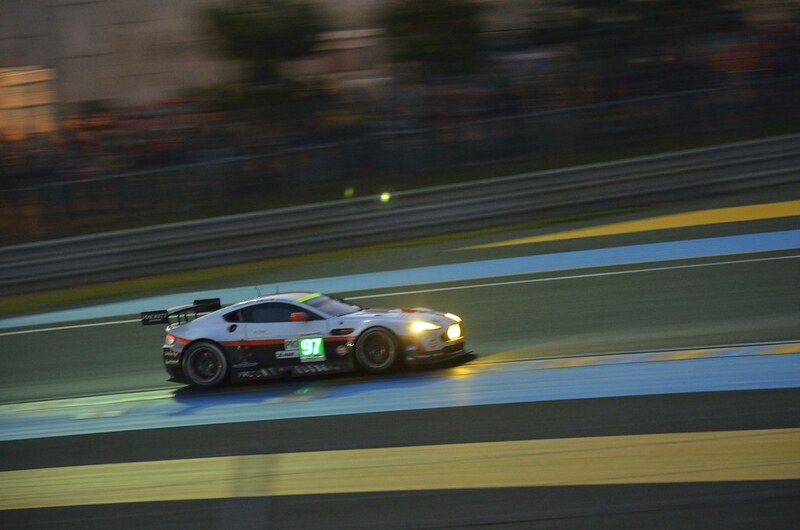 Over our heads the fireworks go off, but the GT battle rages on in front of us. 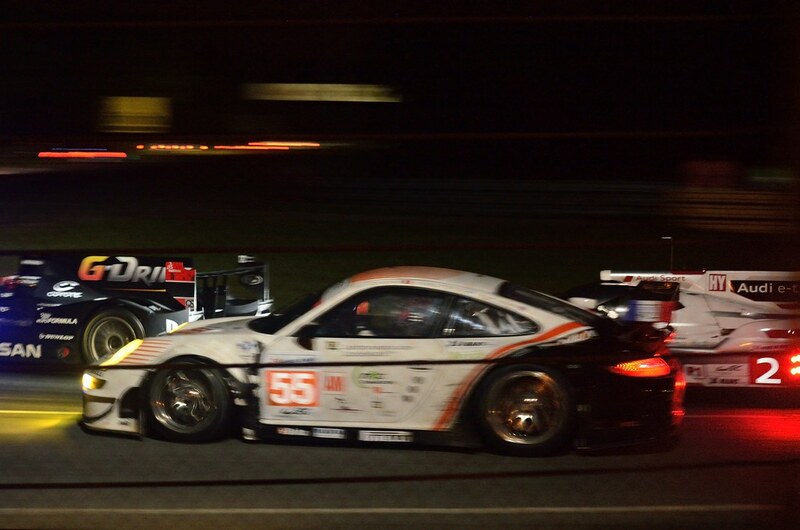 First the Ferrari and a few seconds later the Porsche with the BMW on his bumper. 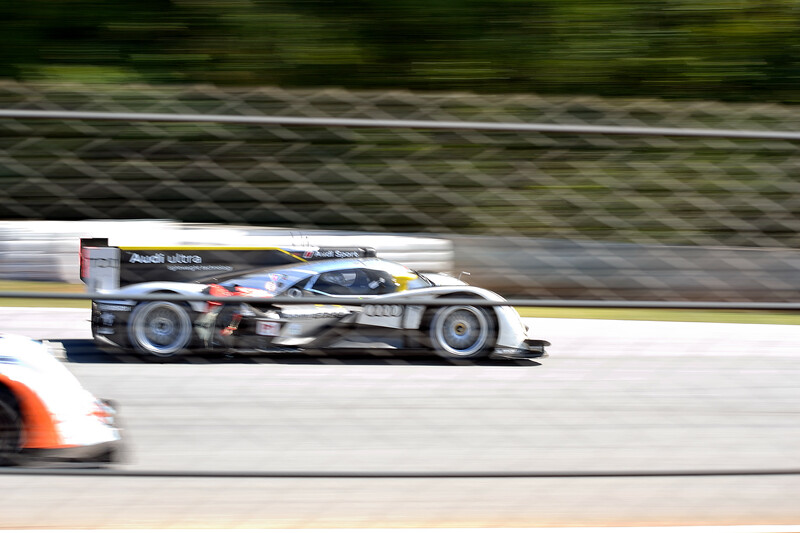 Through 10A and 10B, under the bridge and across the finish line, the Porsche holds onto second with the BMW in third 2/10ths of a second behind him. 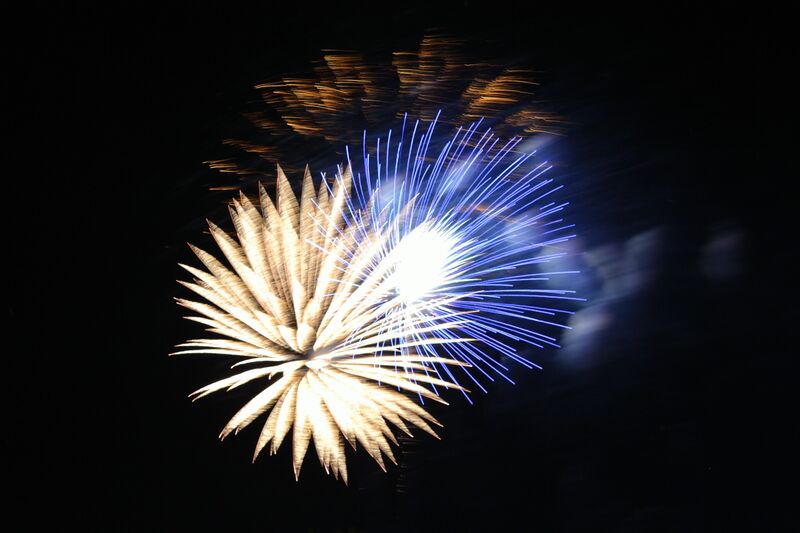 The fireworks continue and we watch the last of the competitors file past us. I’m not going to lie, I’m really disappointed for Audi. 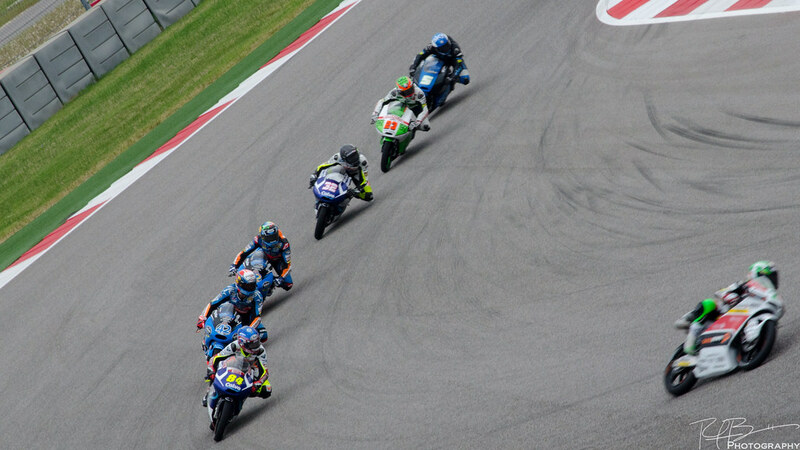 Bad luck, bad timing, and bad decisions kept them from returning to the top step of the podium. Congratulations, however, to Peugeot. They too had bad luck, bad timing, and bad decisions but they fought through 1,000 miles and came out on top for the third year in a row. We gather up our stuff and the five of us make our way back to our cars. 15-20 minutes later we’re loading up our cars and we say goodnight. It was a lot of fun watching the last few hours of the race with Jim and Kris along side Dad and Ted. It’s a shame we didn’t catch up with Clay at the track. I should have called much earlier in the day. Guess, I’ll have to come back next year, Clay! Despite the number of cars and the sea of taillights in front of us, we make it out of the track in fairly short order and back on the highway rather quickly. Tired, but still excited from the race action all day, the three of us have one last night cap in the hotel bar. The clink of the glasses and a toast to a successful race trip, we down one last scotch before calling it a night. We’re up early Sunday morning, return the car, catch the train to the airport, get through security and finally board the plane home. It’s been a quick two weeks since the race. I’ve been working on this and processing my 800+ photos and almost 30 minutes of video. Thanks again to everyone who was part of this trip. 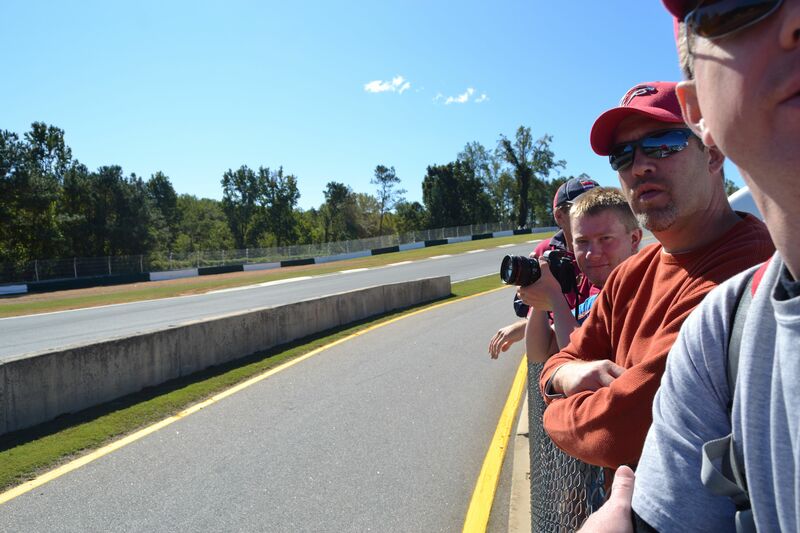 Dad and Ted, it was great to have you guys with me as we experienced a wonderful race at an excellent facility. Jim and Kris, thank you so very much for meeting us out for dinner and catching up with us at the track. It’s a great treat to have met you two in France and continued our friendship Stateside. Clayton, again, I’m sorry we couldn’t get together on-track, but your notes and tid-bits about the track and what to expect were priceless. 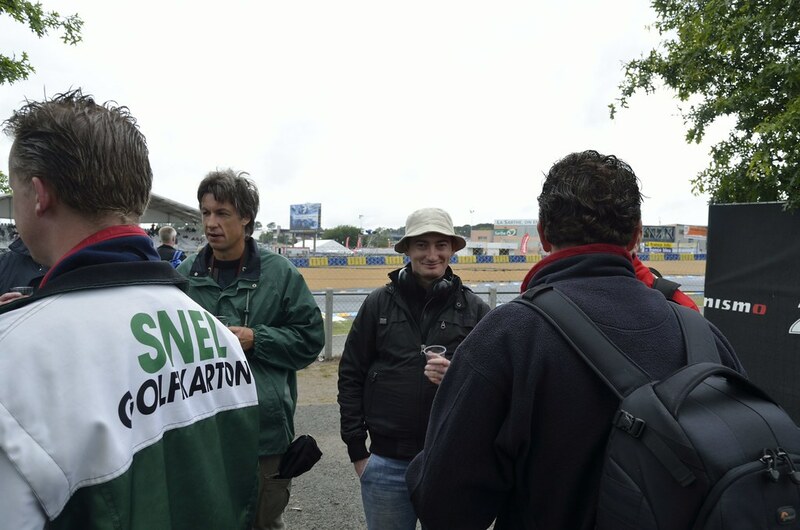 I guess now it’s time to change the name of the blog back to it’s original state and start planning for the 2012 24 Heures du Mans. Just found this. Great music and great video. Really takes me back. Thanks to WideEyedProduction for creating this.